I’ve begun a walking regime since my knee is still recovering and I figure walking will help both it, and the rest of me! So, sometimes I combine the walk with an errand or two I need to run. Today, I needed to visit the post office. Always a treat 😏. The following is the trip in photos. Leaving Piazza Mattiotti in front of our house. 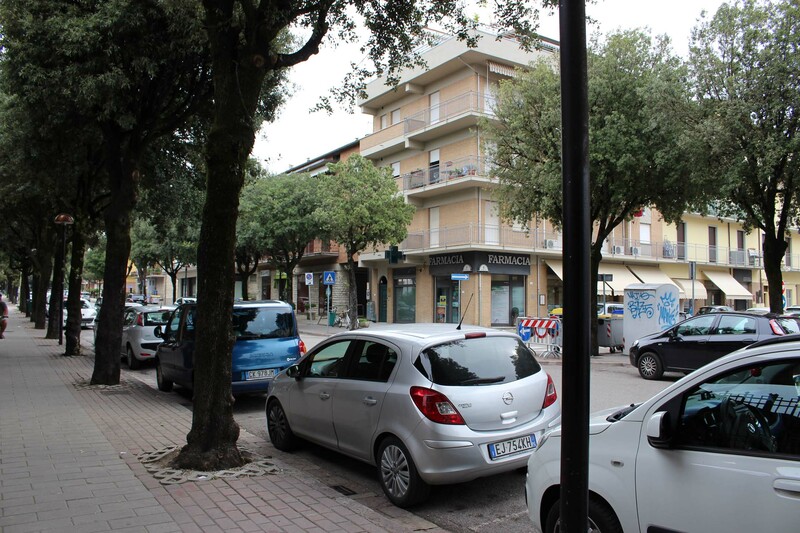 Via Garibaldi, one of the main shopping streets. Train Station. I turn left here. 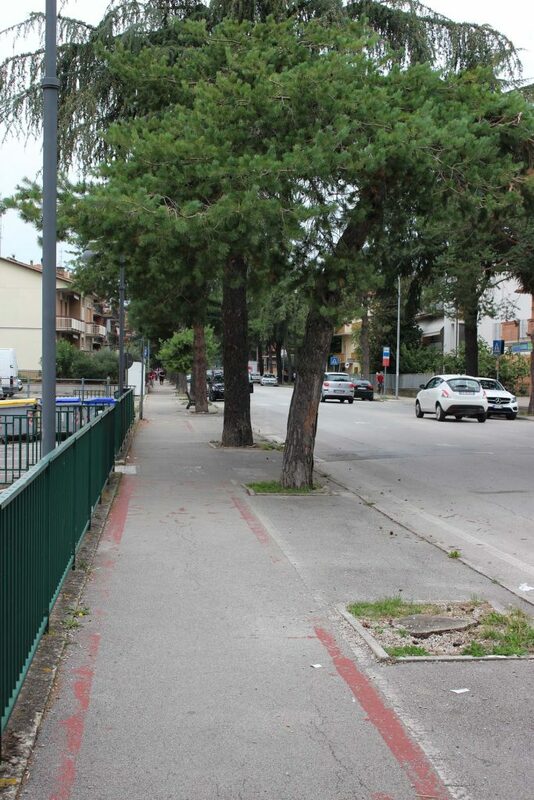 Viale Unita d’Italia. There is a Moroccan store here where I can find spices and sometimes Cilantro. Arrived at the Poste Italiane. Ugly building!! First you pick which thing you want to do and get a number. 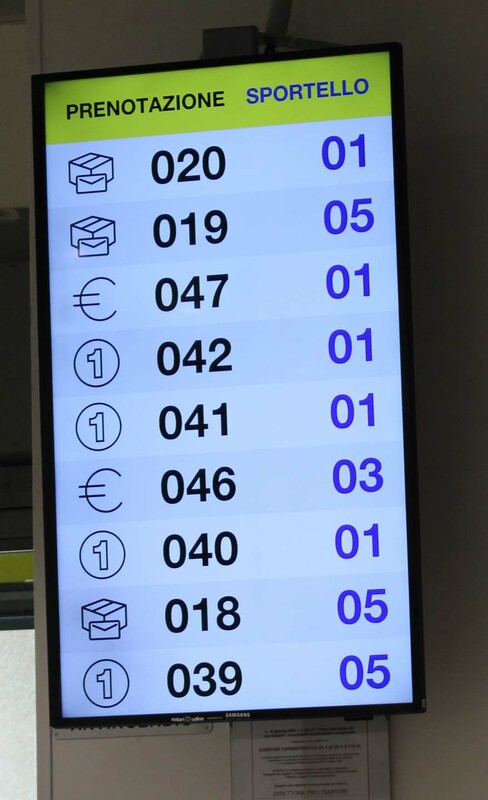 Your number and window come up on the board. 020 – that’s me! Finito! Successfully mailed my package. On towards home. This is Via Carlo Marx. Umbertide was reliably communist until recently. Pass by the theater. They have English language films on Mondays or Thursdays. Mamma Mia! Come to the fork between Viale Unita d’Italia and Via Roma. I’m heading down Via Roma on the right to home. 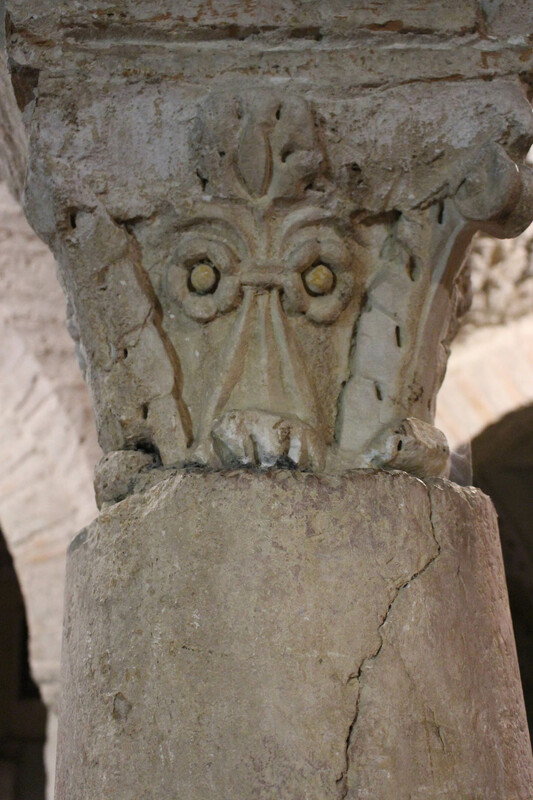 Back to the Centro Storico! 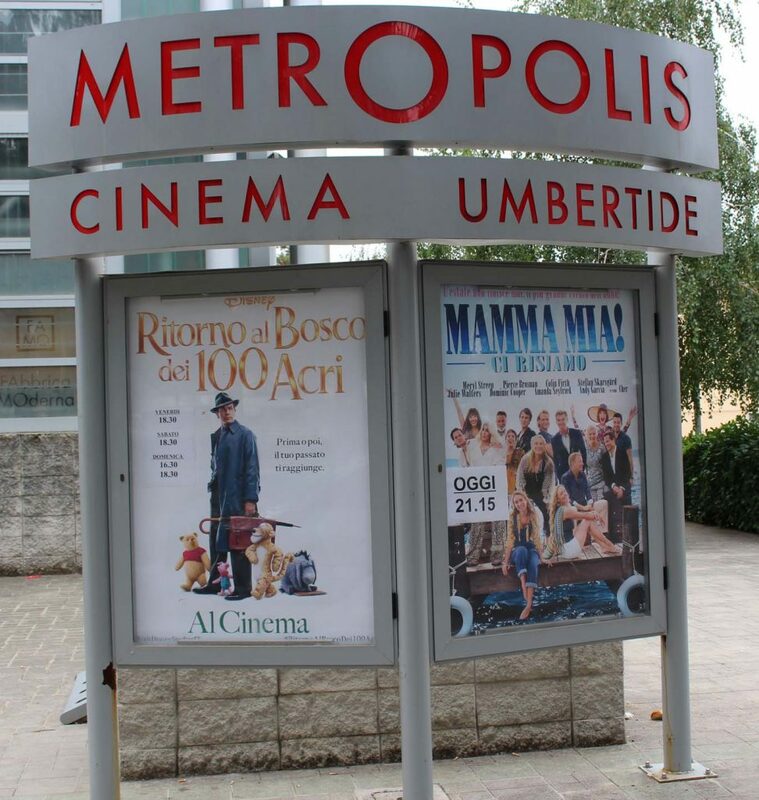 Umbertide has everything we need. Some of it is not so pretty but it is functional unlike some of those pretty hill towns. They usually are all looks and no substance. 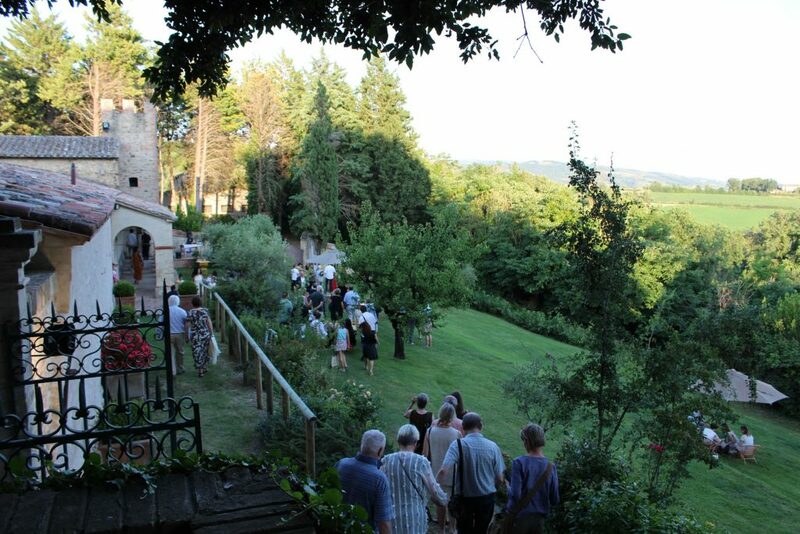 This entry was posted in everyday life in Umbria, Italian life, Umbertide on September 17, 2018 by Nancy Hampton. Ah. 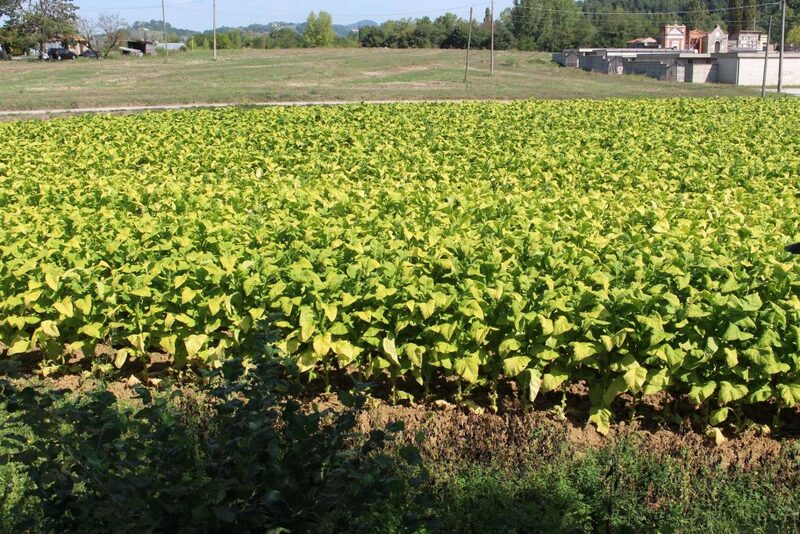 It’s the season for the Yellow Waves of … Tobacco?! Yes, tobacco. 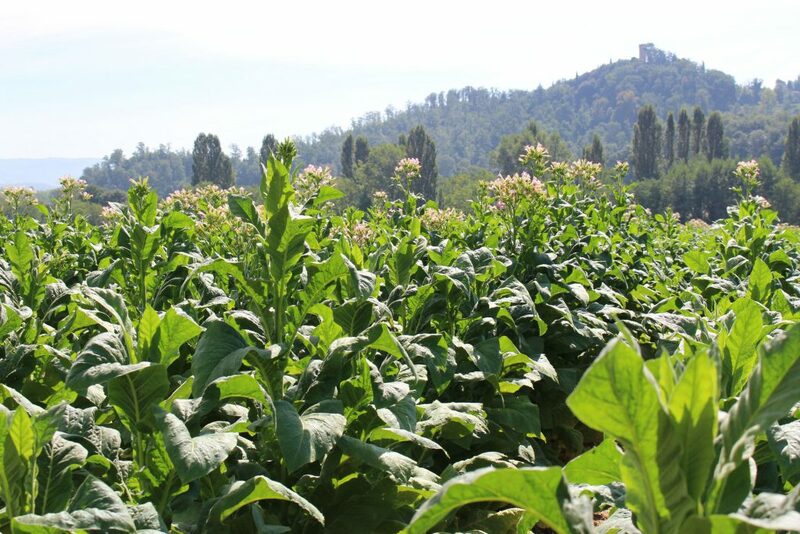 From about Perugia, northward to the mountains and the source of the Tiber river is fertile ground for tobacco. All along the river plain and up into the valleys to the east and west you will see field after field of tobacco. It is a huge cash crop for the farmers around here. 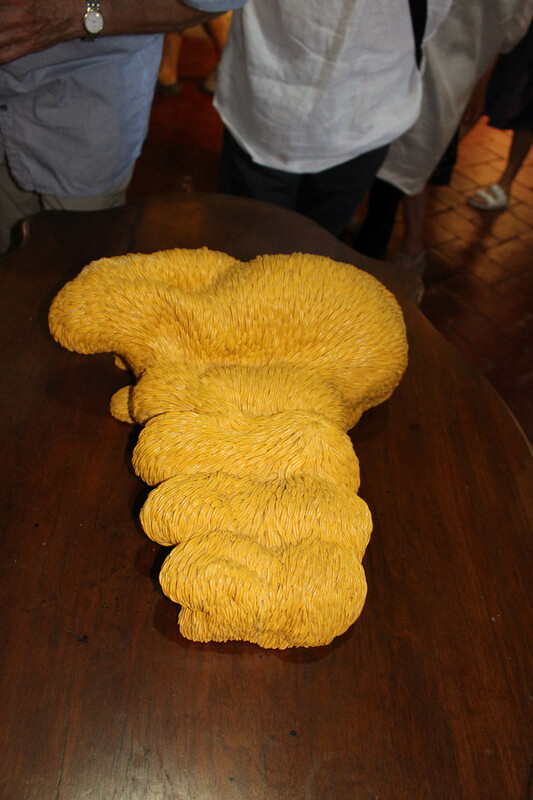 It is used to make cigarettes and also the Tuscan cigars. 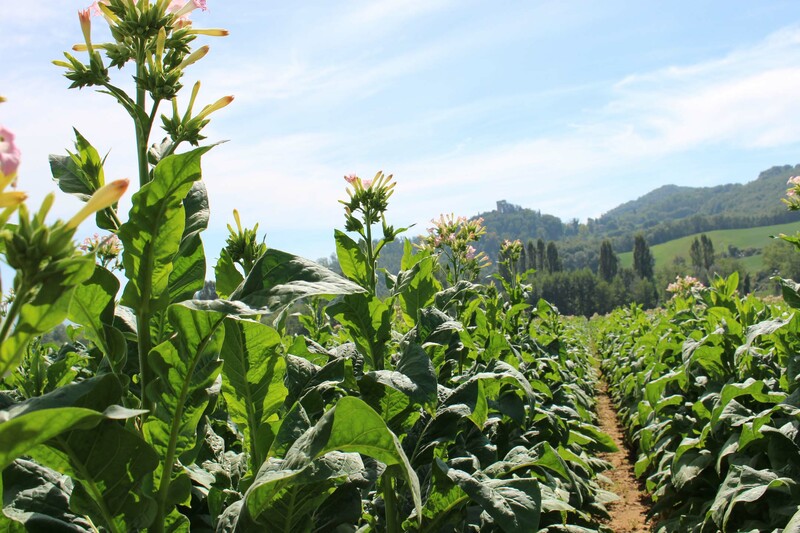 Umbria is one of three regions in italy to grow tobacco, the other two are the Veneto and Campagnia. Farmers practice rotation of their fields. 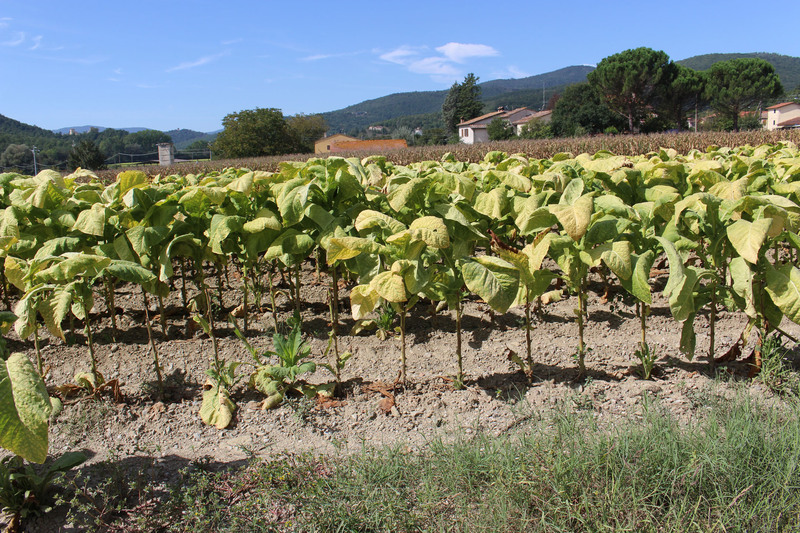 The rotating crops are: sunflowers, corn, winter wheat, tobacco, and one year the field is fallow. Sometimes they plant legumes and plow them under in the fallow year. It enriches the soil. I figure it’s none of my business who grows what and I don’t mind if they grow tobacco. I won’t be smoking it but many people do. And to tell the truth, it is a beautiful plant. Especially now when it turns from dark, forest green to bright lime, to yellow. I found out it is in the same family as eggplant, pepper, petunia, potato, and tomato. Tobacco has a small seed, which cannot be sown directly in the field; seedlings are raised in selected and tended seedbeds where protection is given against heavy rain and excess sun; young seedlings are planted out by hand or mechanical transplanter, and spacing between seedlings and rows varies with the kind of tobacco and with the location. 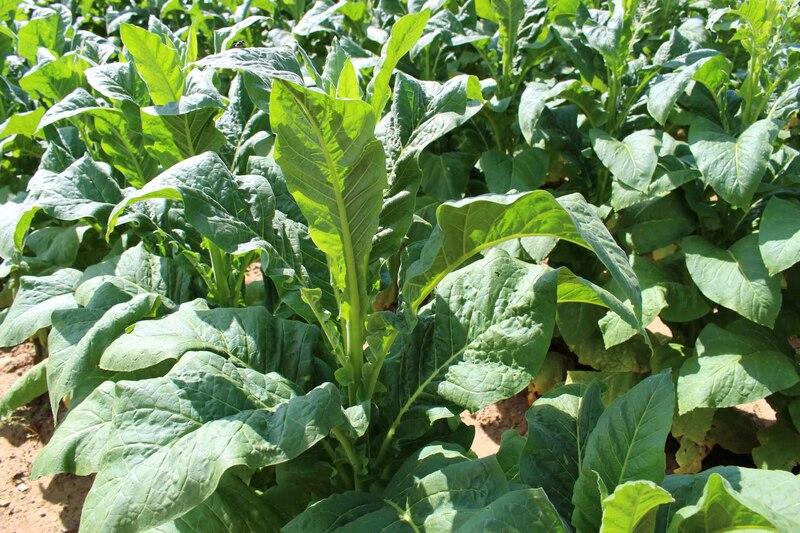 Tobacco is picked when leaves are “ripe”. Leaves ripen progressively from the bottom of the plant to the top, so lugs (the bottom leaves) are picked first and tips picked last. The plants must be watered throughout the growing season. Most fields are within a short distance of a water source so water can be pumped to irrigate the fields. 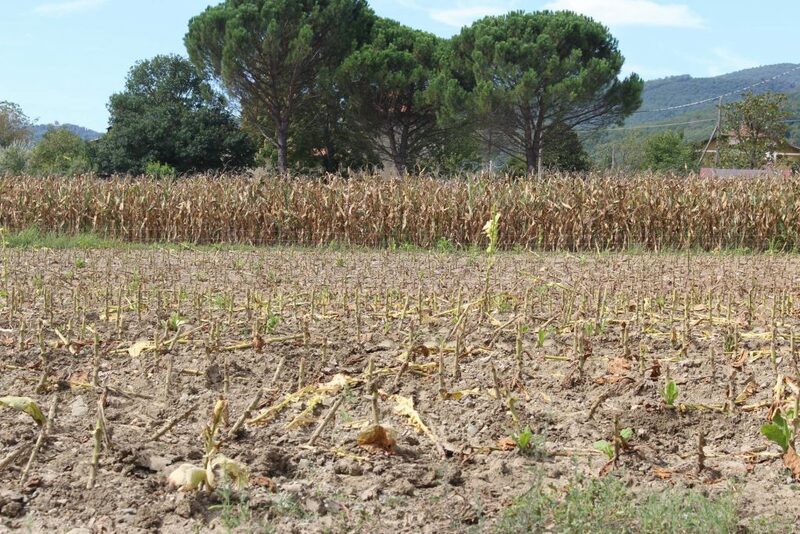 This field is just beside the Tiber river. Rich and green before it begins to ripen. The plants do get flowers and many farmers de-flower them so they don’t go to seed. Some don’t seem to do that. The foreground plants were left to bloom. The blooms are pretty, ranging from pink to red. Beginning to ripen. 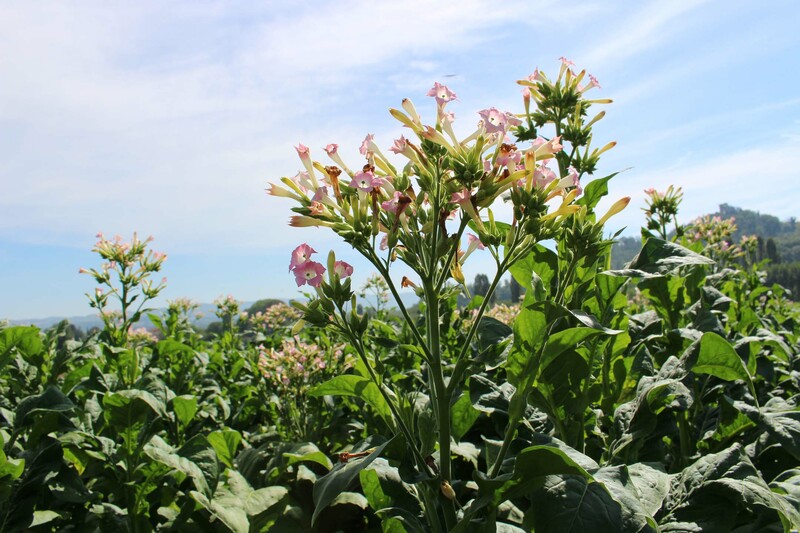 Typically tobacco is picked six times, with three leaves taken per pick and six leaves in the final pick. Gradual picking may continue for 2 months. These have the very bottom picked already. There are harvesters that take just the leaves from the bottom off and work their way to the top as they ripen to leave the stalks. The leaves are piled high into green farm wagons pulled by tractors to the ovens found throughout the area. Here is a row of ovens. The tobacco is half dried here and packed and shipped for final processing. It is a seasonal rite around this area so I look forward to watching. And it is a part of the rhythm of life. The beginning of Autumn. This entry was posted in everyday life in Umbria, Italian life, Umbertide, Umbria on September 12, 2018 by Nancy Hampton. 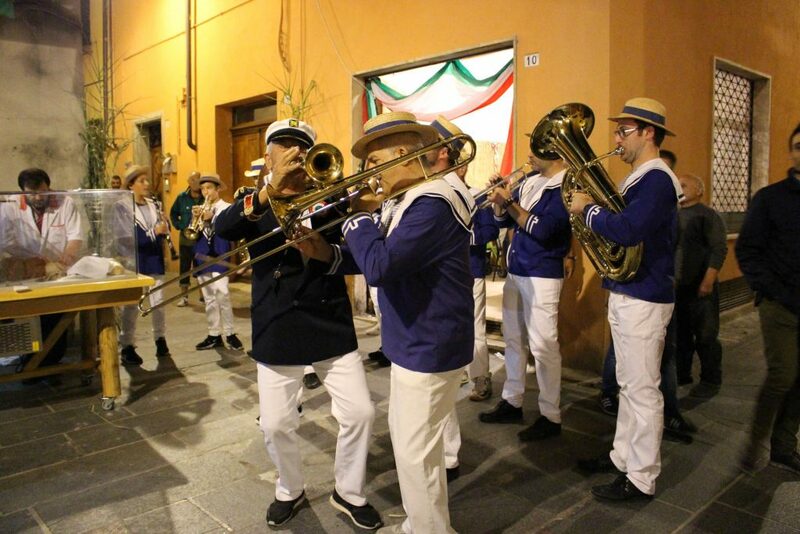 Saturday is traditionally the big finale of the Ottocento feste. We were meeting friends for dinner and as we walked I took some pictures. 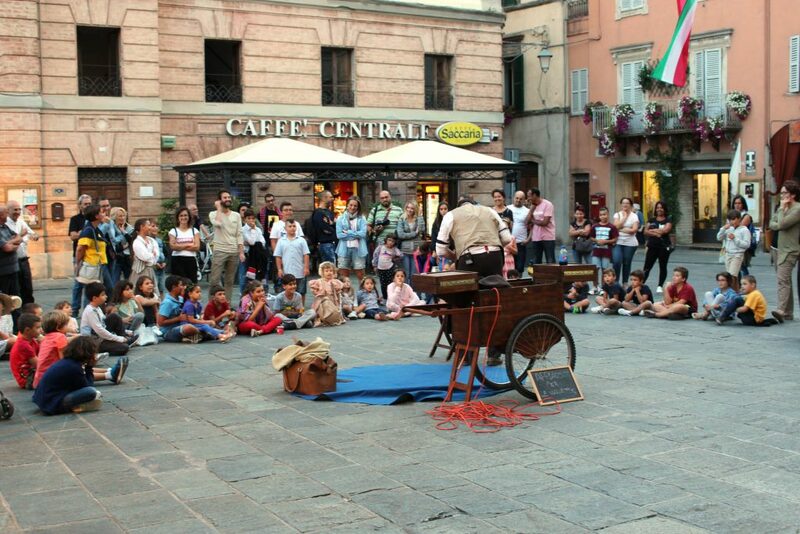 This first one is of children rapt watching a performer. Along the tiny alley down which was our restaurant I took a picture of a milliner and also an example of a kitchen of the time. 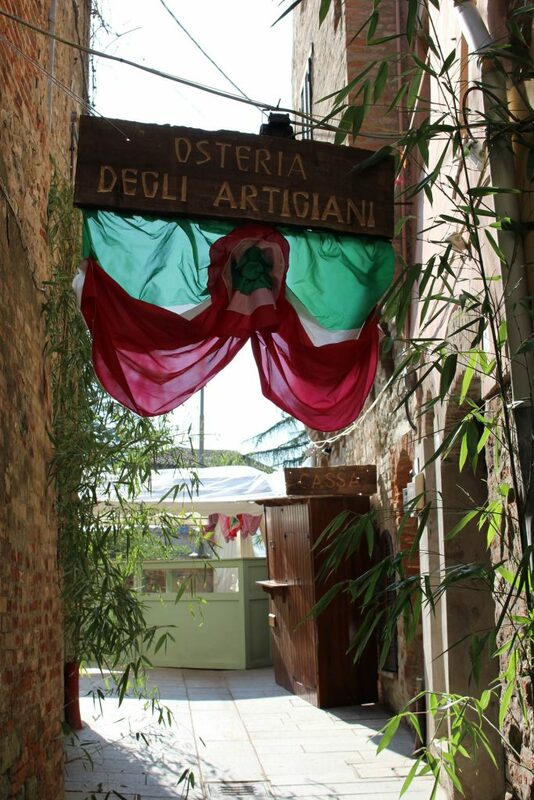 Our dinner was at the Osteria Degli Artigiani. It was sponsored by our friend Patrick Piccione and he chose some wonderful wines for us to taste during dinner. The food, not so great. It was fun sitting at a table for eight, us four Americans and four young Italiani. They were nice. While there we had many folks passing by and I snapped some pictures. 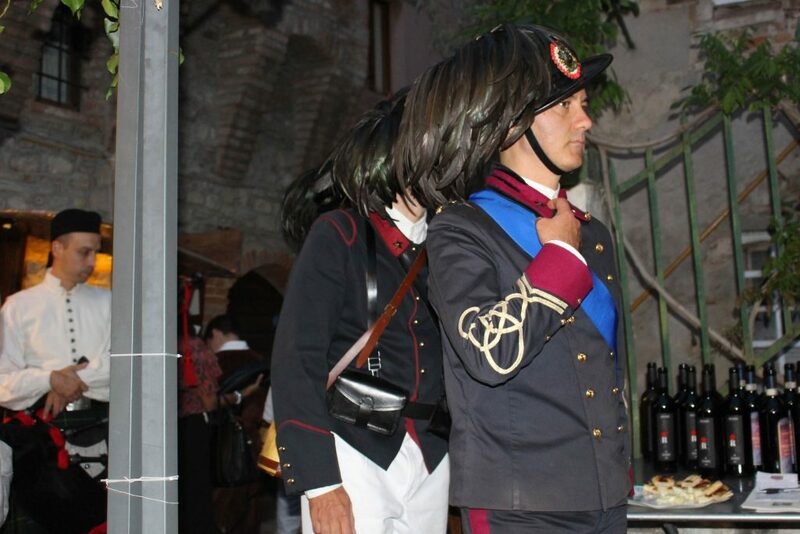 These are the Carabinieri. Even then they had spectacular uniforms! 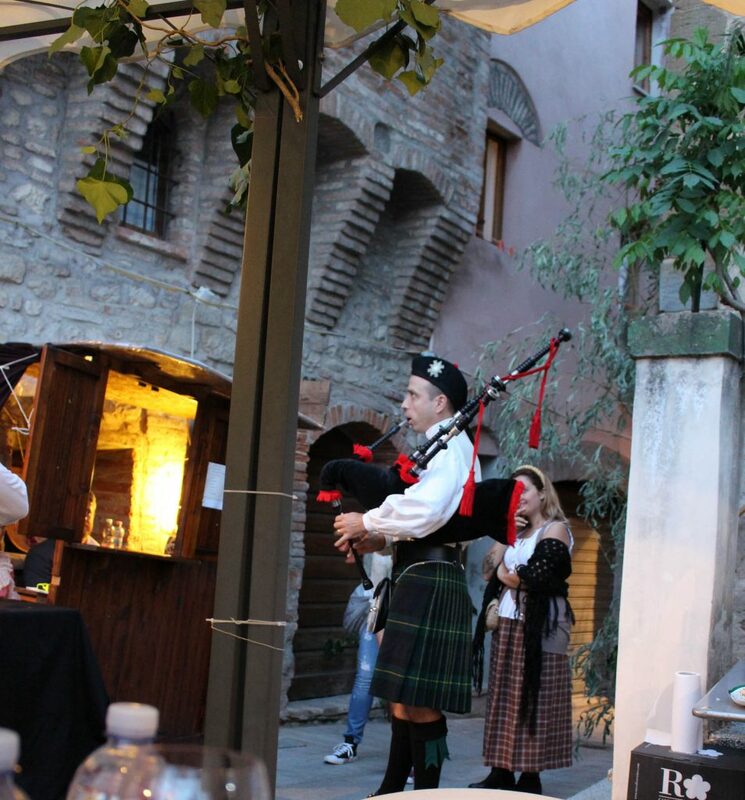 Serenade by a bag piper. After dinner we wandered around. Here is the most elegant pop up restaurant complete with oriental carpets, velvet chairs and chandeliers. At 12:15 this is the crowd. Oh, by the way forget what I said about music all being from the 1800s. 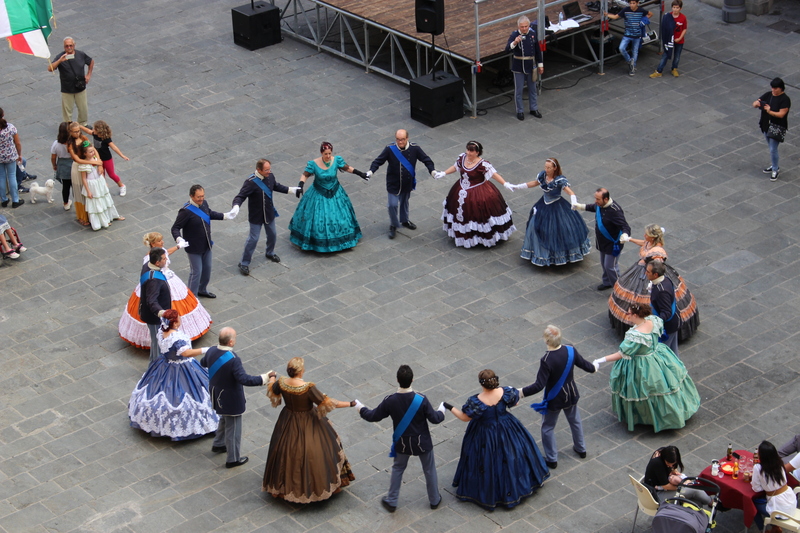 Today, outside, There is waltzing. Pretty dresses. This entry was posted in everyday life in Umbria, Festivals and Sagras, Umbertide, Umbria on September 2, 2018 by Nancy Hampton. 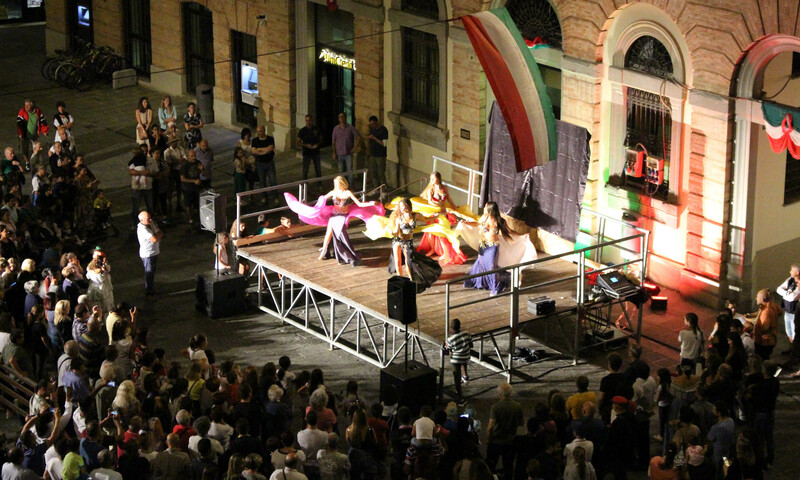 It is again Umbertides time to shine with the big Ottocento feste. I went out early for a walk and snapped a few photos of the preparations. 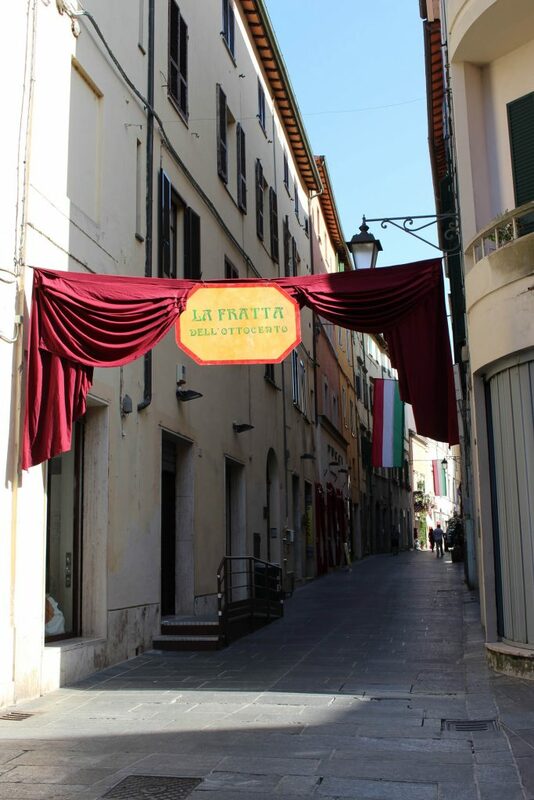 Every entrance to the Centro Storico, historic center, has red drapery and proclames La Fratta del Ottocento. La Fratta was the old name of Umbertide. And the word Ottocento, literally ‘800’ (shortened from mille ottocento ‘1800’), used with reference to the years 1800–99. 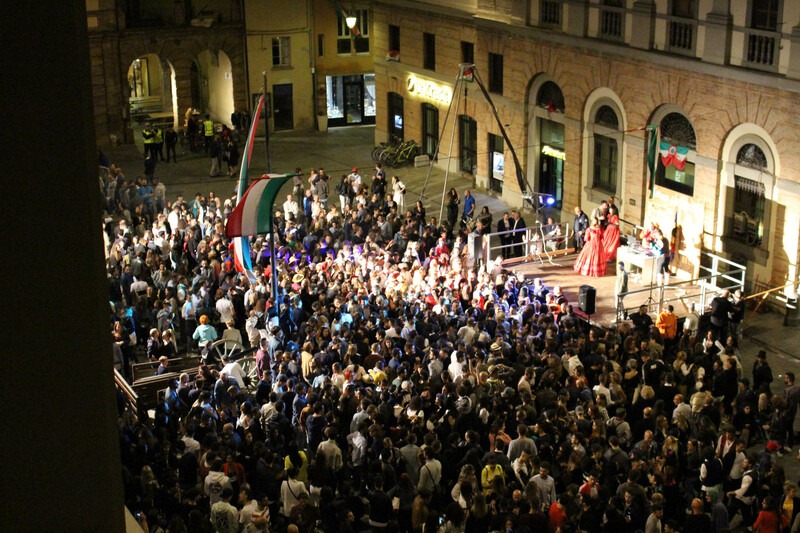 The feste celebrates and re-enacts the independence of Italy and the Italian unification into one country. 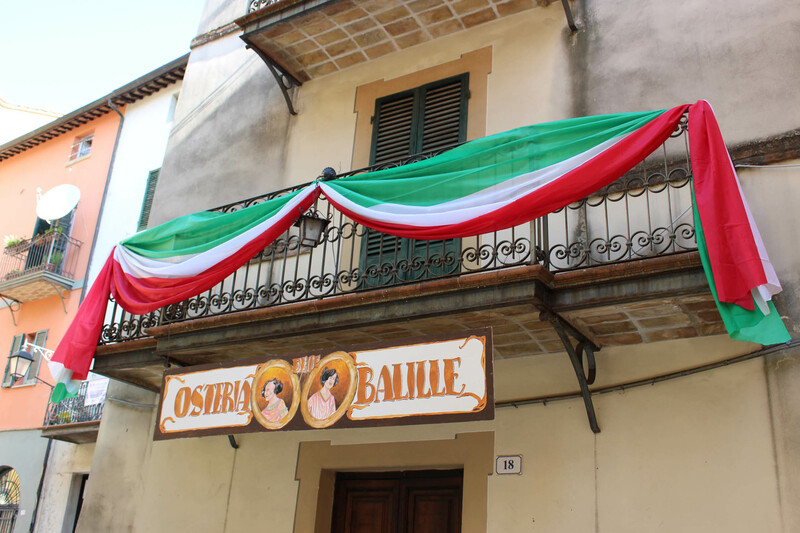 It was facilitated loosely by Giuseppe Garibaldi and over four days the townspeople wear costumes of the late 1800s, serve food of the time, and have entertainment in keeping with that century. Hence no bad rock and roll! This does not mean ear plugs are not welcome at night 🙂 Here are a few entrances. Here is the hairdresser on our street. I love that the shopkeepers all get into the spirit. 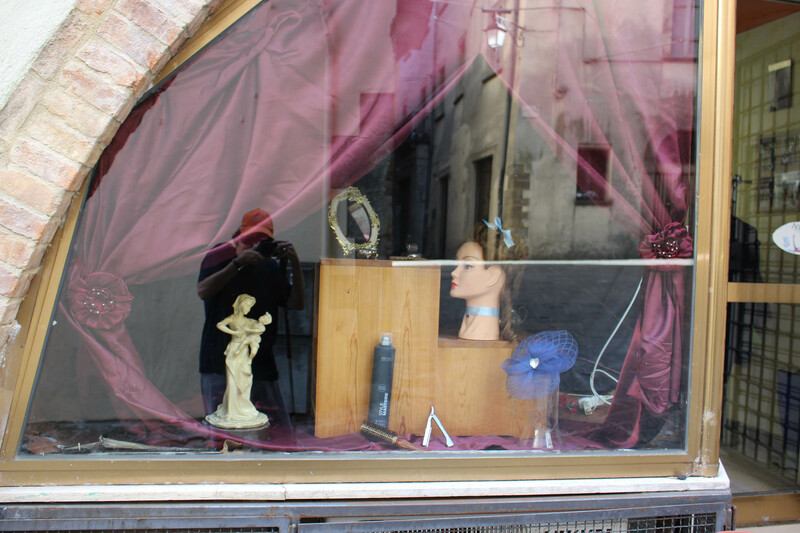 This window reflects a hat and hairdo of the time. Here is the latest in fashion! They use cranes to hang the banners and bunting. I think there are about fifteen pop-up restaurants. Interesting how they can be set up all through town. And behind basement and garage doors are whole kitchens from which they can provision them. You never know they are there until an event. Here are a few of the Osterie and Trattorie. 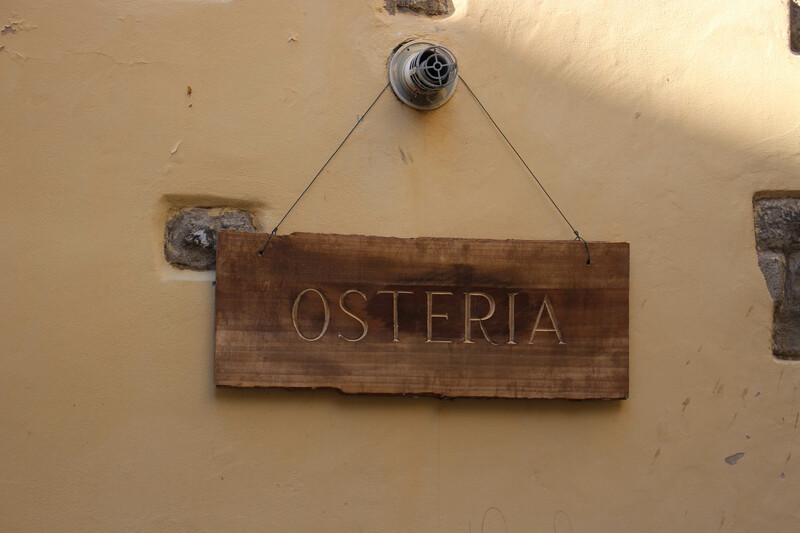 Interestingly I recently read that the original Osteria was a bar where men went to drink. It was only after WWII that they became eateries. We will forgive our feste for this little oversight! I loved this! 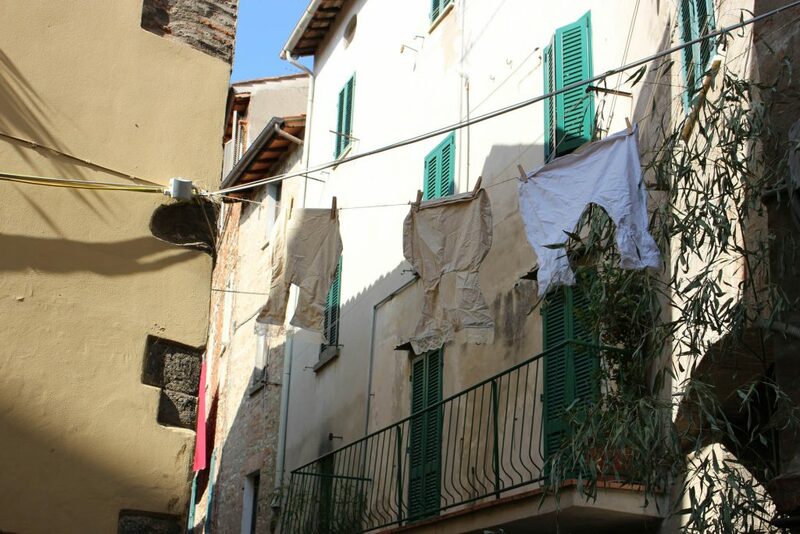 Old fashioned bloomers hung to dry in one alley. Of course Ottocento would not be Ottocento without our Briganti. 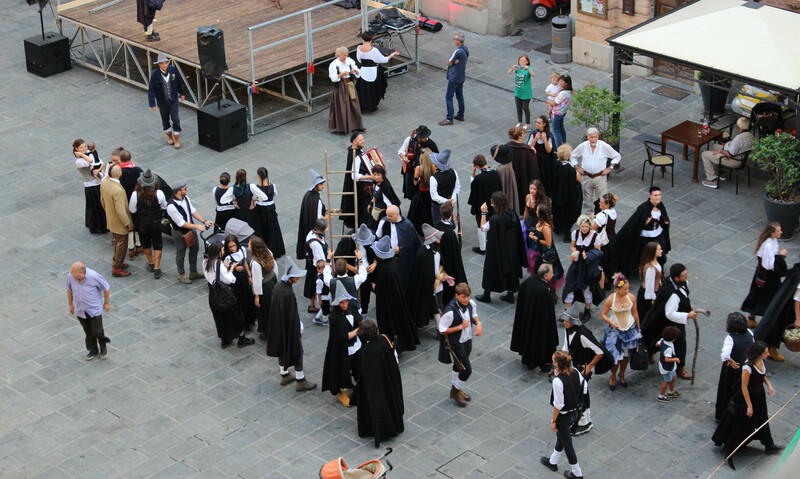 These are the brigands who get up to mischief and mayhem and take the town on Saturday night. Here is their arrival on the first day. You can’t miss them because there is constant rifle fire to announce them! Note the ladies of the night among them. How could they not be?! 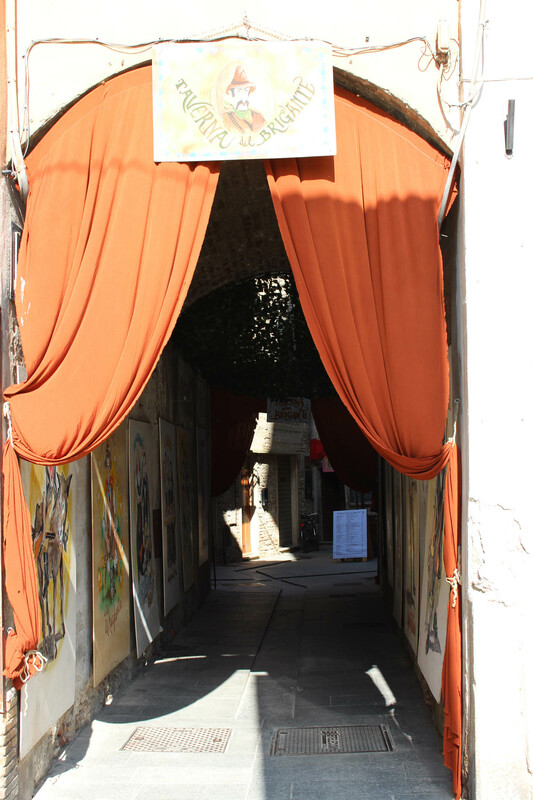 The Briganti go back into their lair where you can dine in thier Taverna if you like. They keep a low profile until Saturday night but they still sing, dance and play music as well as drink and carouse. And later last night our first entertainment. Belly dancers! 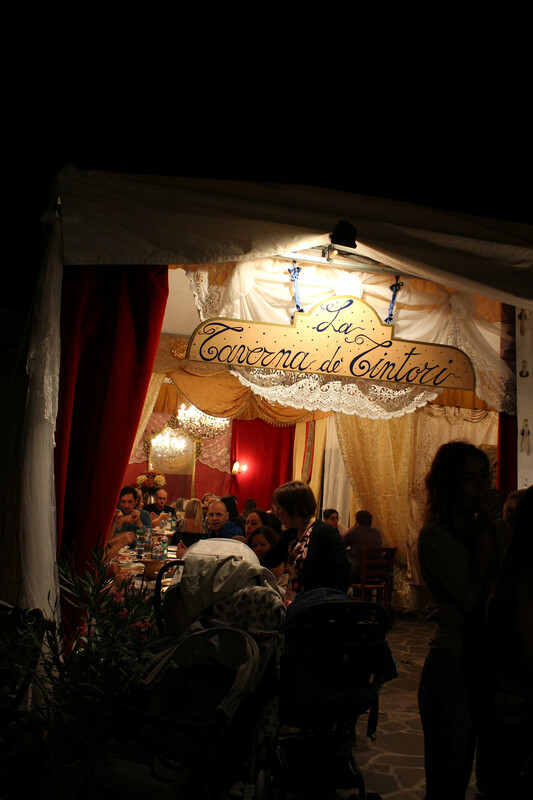 This entry was posted in everyday life in Umbria, Festivals and Sagras, Umbertide, Umbria on August 31, 2018 by Nancy Hampton. Saturday market and my haul from last week. Normally I shop the weekly markets that come to town on Wednesday and Saturday for all of my produce. 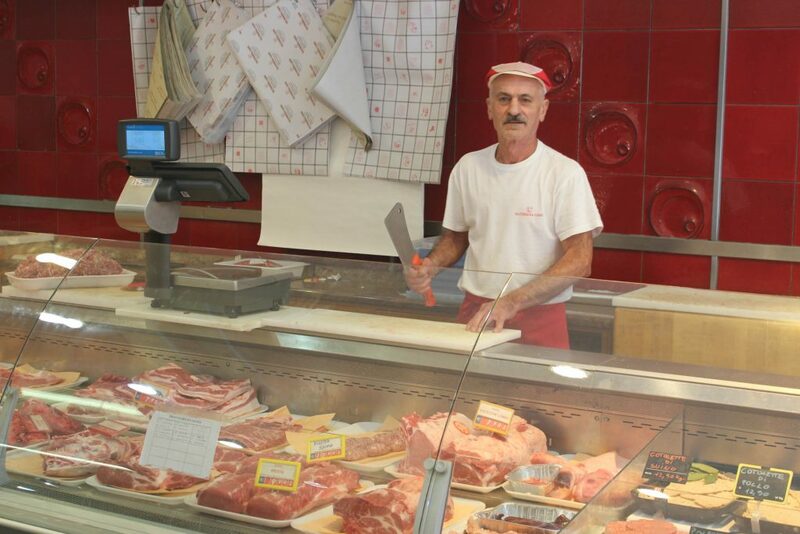 I buy most of my meat at one of the four butchers. Bread comes from the nearby bakery. 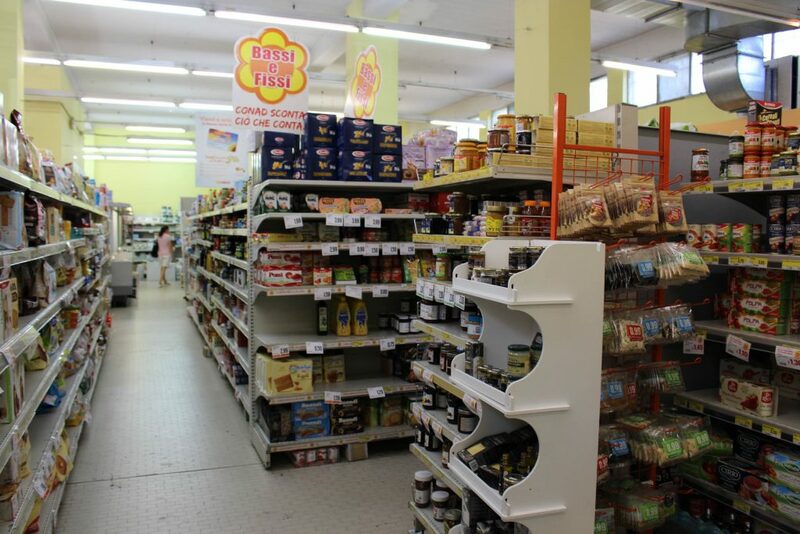 And other things, like cleaning products, flour, sugar, milk etc I get from our close local market, the Conad. It is small but has most things. Then there is Angelo’s Alementari. It is in our building and very convenient for many things. Pasta, prosciutto, cheeses, and most staples are in his store – plus he is a great guy. There are also a number of chain supermarkets in our town. The Coop shopping chain has good prices and sales, it is a cooperative which you can join for savings, and the quality can’t be beat. 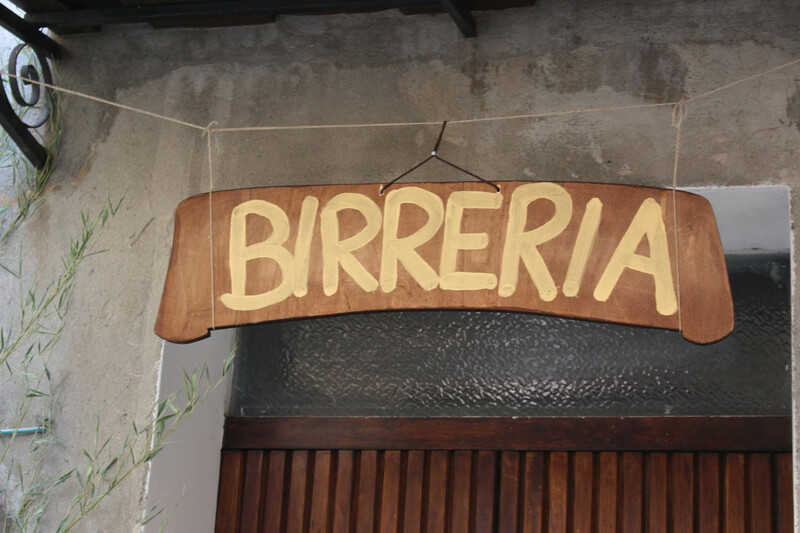 We have one in Umbertide, the biggest store here. 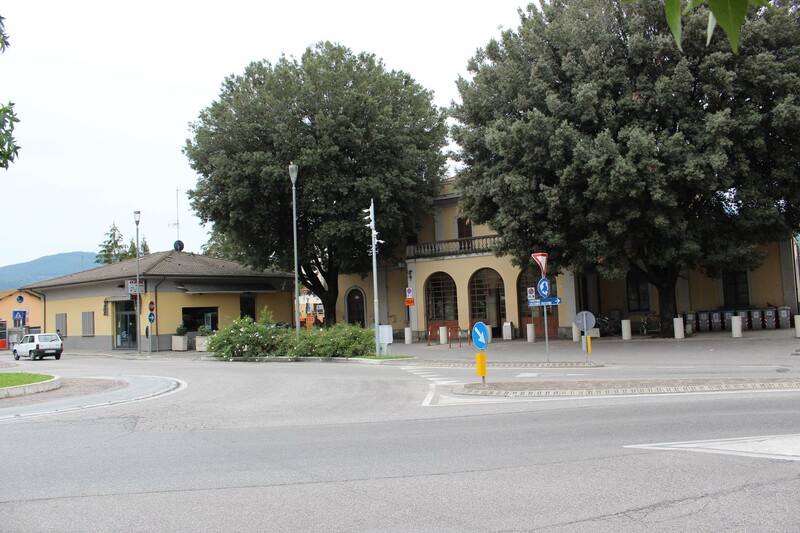 The Conad is comparable – there are 2 in town, one (smaller) in walking distance. 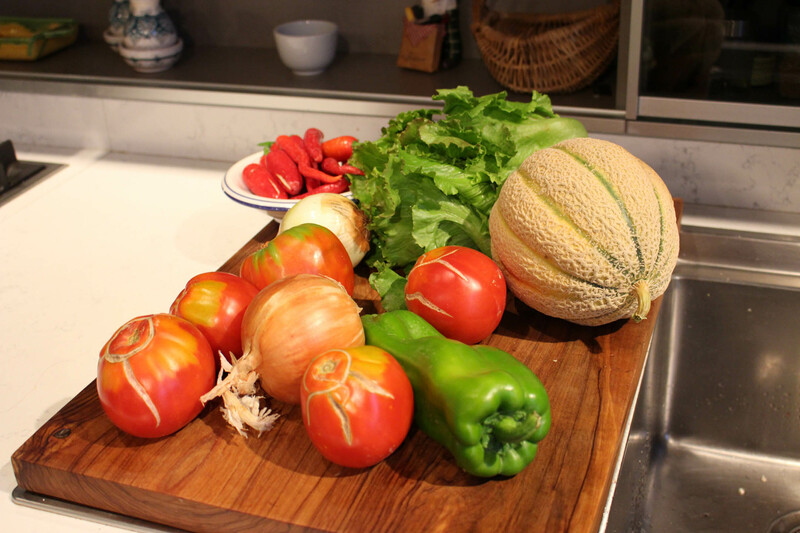 The A&O is in walking distance and has good produce and prices. The EuroSpin is the least expensive with real deals but quirky. Farther afield is the IperCoop. It is huge, much like a Walmart with clothes and most things you’d need. I can find things like tortillas, Helmans mayo, French mustards, black beans, Asian ingredients etc there. We go about once a month. All the chain supermarkets offer good sales monthly. Little supermarket near us. Conad. 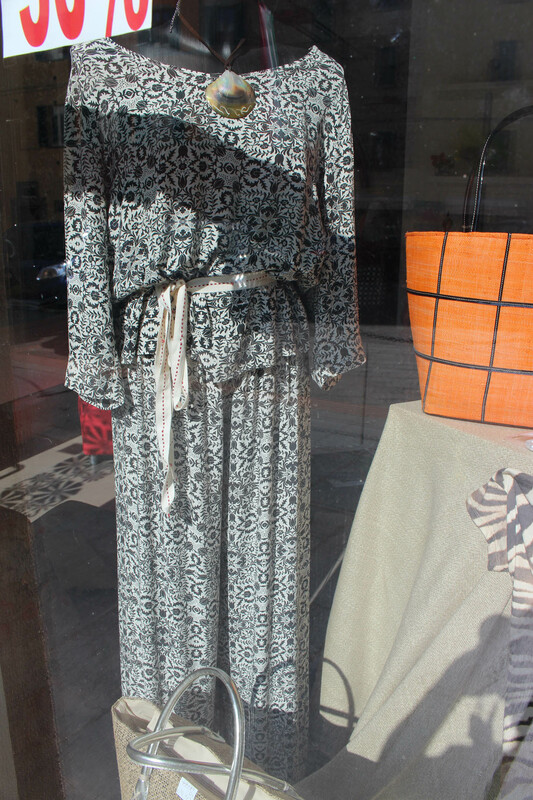 But sometimes we want to do special shopping trips. 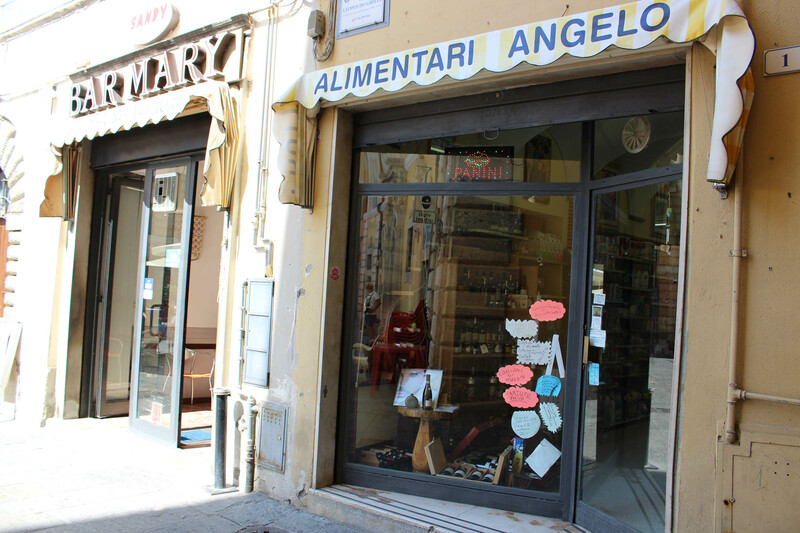 We go to Abruzzo where there is an Essalunga, a huge American style store with just about everything. It won third place for worldwide supermarkets after Wegmans and Whole Foods. We go maybe 2-3 times a year. It is about 45 minutes away. So that’s about it. My normal shopping routines! Also this week…Market find! 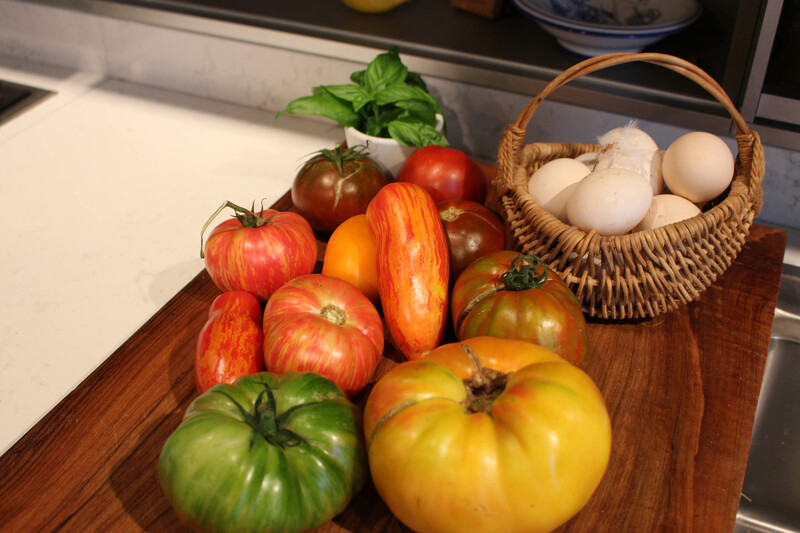 I used to get Heirloom tomatoes from a man who came on Saturdays to Umbertide. But he has not been here for 3 years and I’ve missed his tomatoes terribly. By luck a friend posted pictures of a bunch of tomatoes on his FaceBook page and they were heirlooms!!! I found out he goes to the Citta di Castello local market on Tuesday so I made a bee line up there and sure enough, it was the same man! I bought 2 Kilos of tomatoes of all colors and sizes. And they cost only 3 Euro. I also bought those local eggs while up there. They are covered in chicken poop and even have a feather stuck to one. It is how you know they are fresh. Eggs are not refrigerated here since they are not washed like in the US. So they keep their protective film which keeps the bacteria from getting in. This entry was posted in everyday life in Umbria, shopping, Umbertide, Umbria on August 15, 2018 by Nancy Hampton. I have noticed I have a number of email subscribers that are Bots, i.e., not really people. I have no idea why anyone would target my blog as it is non-commercial etc. but for whatever reason, they do. SO I am going to go through my list of subscribers and purge the addresses that look suspicious to me. I’m telling you this so you will know that there is an off chance I will delete a REAL person by mistake! So if you notice you are not getting posts in your email from me in the future you may want to check the page and if there are posts you missed, re-subscribe. Sorry for any inconvenience! So August is upon us. The time of year when one cannot accomplish anything because everyone is on vacation. So we have enforced down-time which I guess isn’t so bad. It has been, still is, and will be for the foreseeable future very HOT. Staying inside with all the shutters closed. Drinking cool drinks…speaking of that! August 1 is the day everyone has to have a glass of white wine to keep the snakes away…unless the person who told me that was just pulling my leg! I’ll have a glass of wine anyway! So I’m just catching up on things now that I’m home and idle. A couple of weeks ago we had a magnificent display of flag throwing. 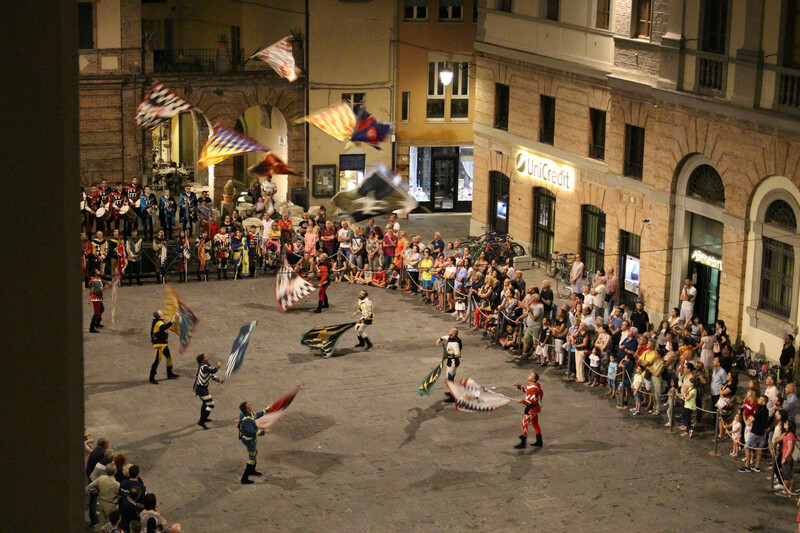 The flag throwers were from a small town called San Gemini in southern Umbria. I took a ton of pictures. Here is one. 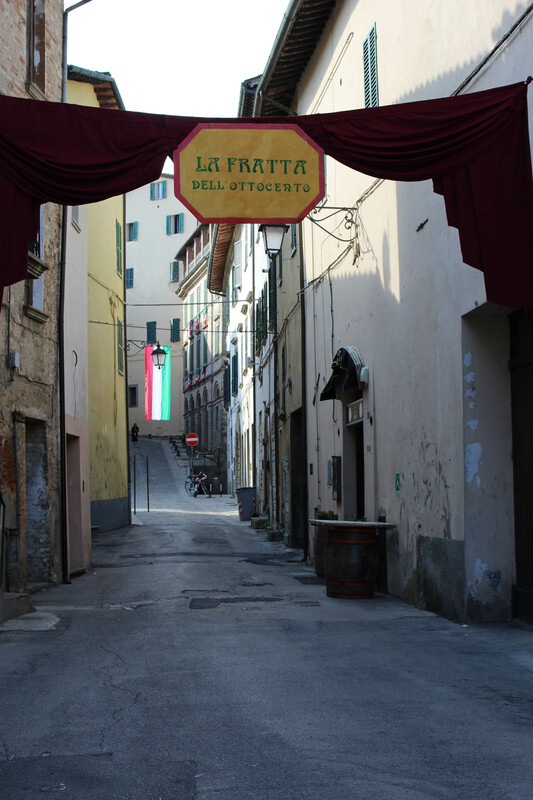 And about a month ago we had the opportunity to go on a tour of Civitella Ranieri. This is the castle, built in the 1400s, which is on a hill above our town. 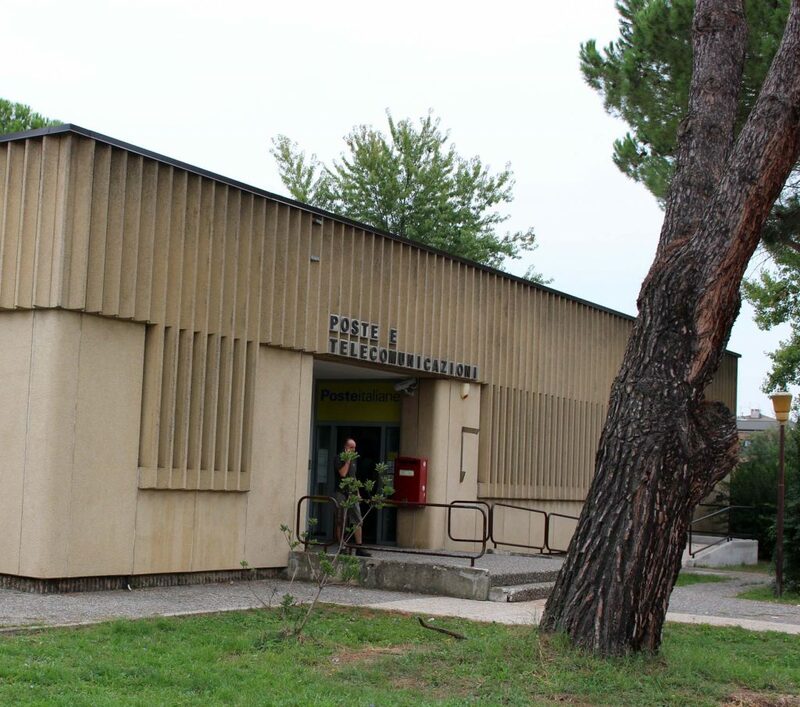 It is leased by a foundation based in NYC named the Civitella Ranieri Foundation. 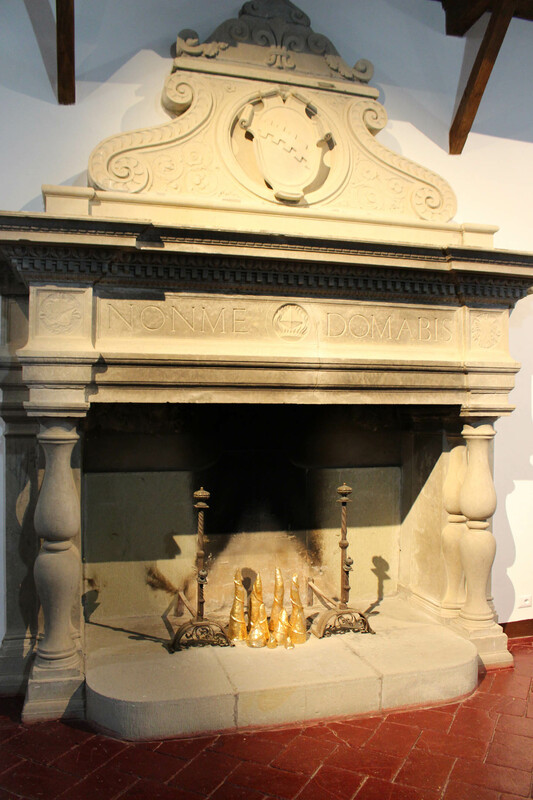 It is an artist residency program that hosts Fellows and Director’s Guests at our castle. But on this occasion they were opening the castle to guided tours. It is a magnificent building. Here are a few photos. 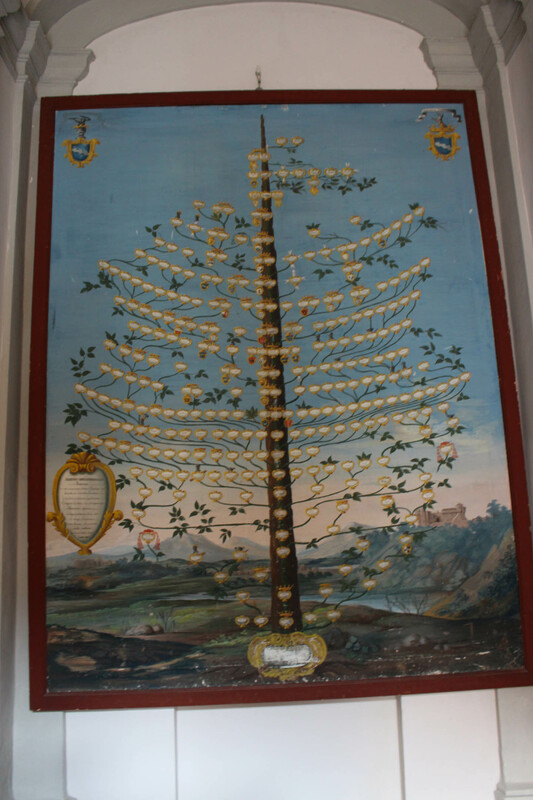 Ranieri family tree. The family still owns the castle! 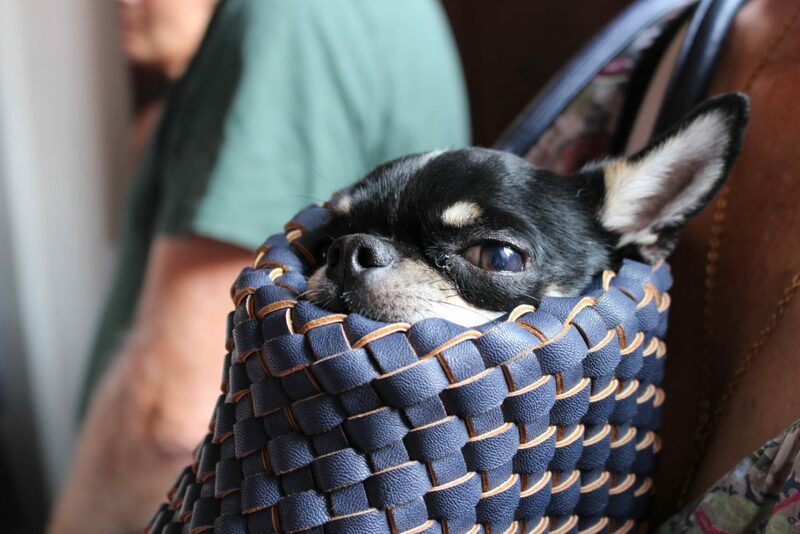 Lady thought her Chihuahua would enjoy the tour. I’m thinking Not so much. 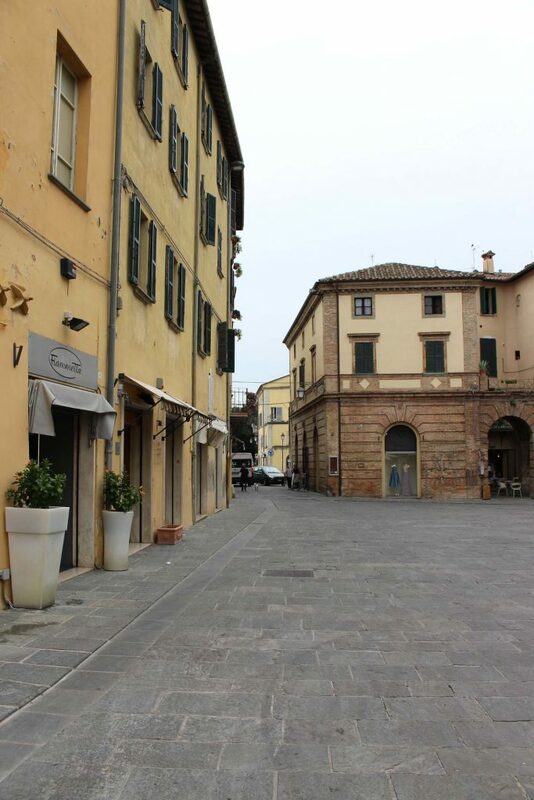 And finally, our friends Joseph and Paul, who live just across the Piazza from us have decided to put their wonderful apartment on the market. 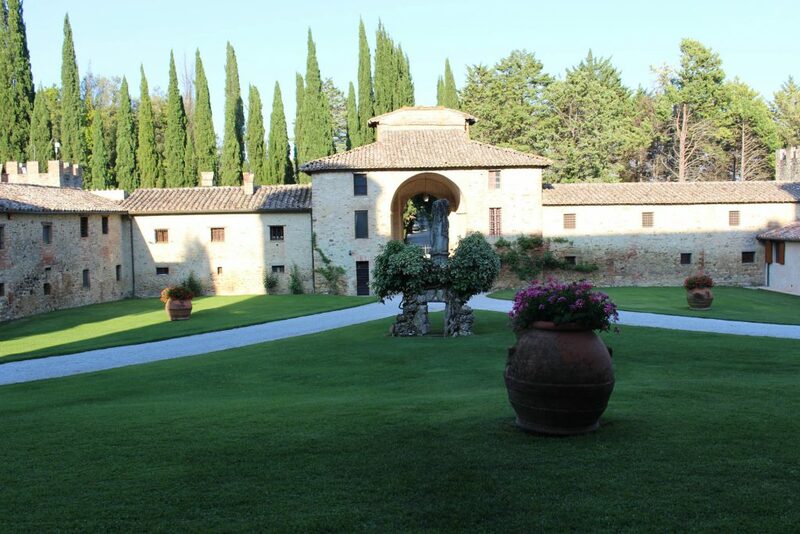 It is definitely a one of a kind property in the heart of Umbertide. Totally renovated and beautiful from stem to stern. But I will let the websites which show this apartment speak for themselves. By the way, some of you may remember this one from the House Hunters International a few years ago. 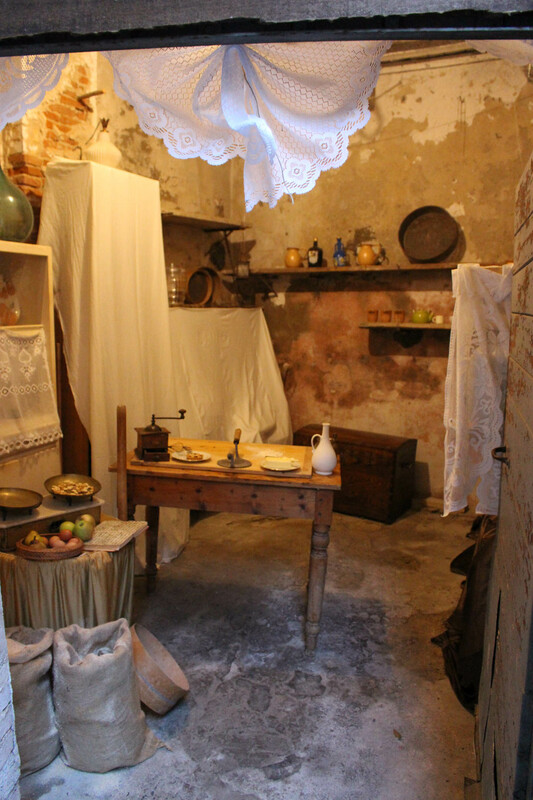 I know many of my loyal followers are interested in someday coming to live here in Italy. And they also may have friends they can pass this along to. So I am showing these listings from my friends as a favor to them. And BONUS! they are offering $1,000 to anyone who finds a buyer that closes. ***a mama bunny and her babies! 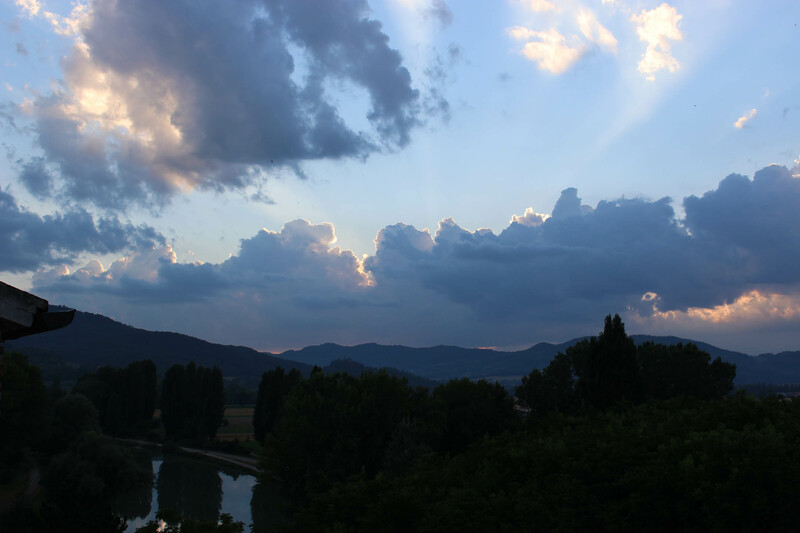 This entry was posted in everyday life in Umbria, Festivals and Sagras, Italian life, Sunsets, Umbertide, Umbria on August 1, 2018 by Nancy Hampton. One thing I have not addressed in this blog is the cost of living here in Umbria. Recently I read a blog talking about the cost of living in Milan. 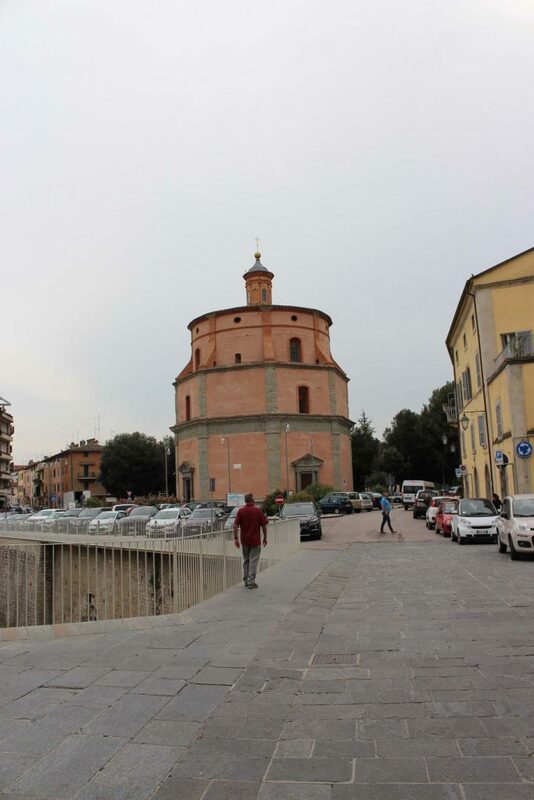 Admittedly, it is less expensive to live there – it’s rated the most expensive city in Italy, than in most cities in the US, but it is still more expensive that many other areas here in Italy. 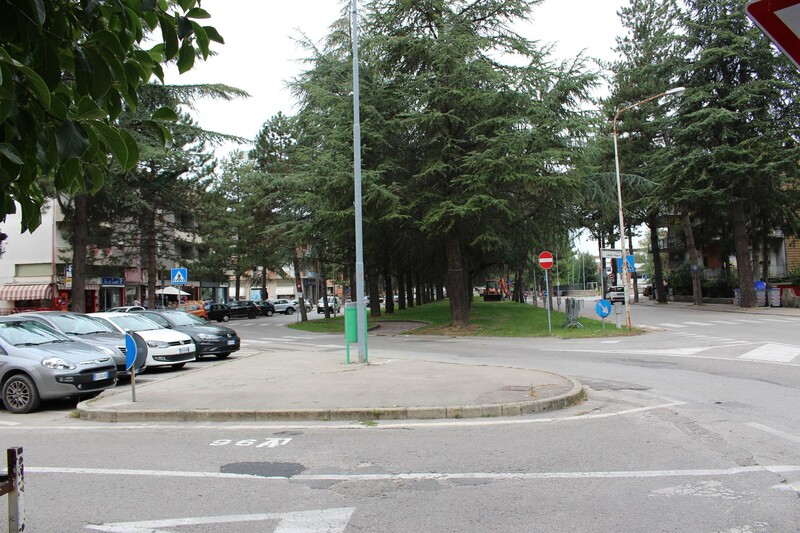 People who are still working and have no choice but to live in a place like Milan do so, but retirees, like us and many people who move here on an ER Visa from the US, do have a choice. 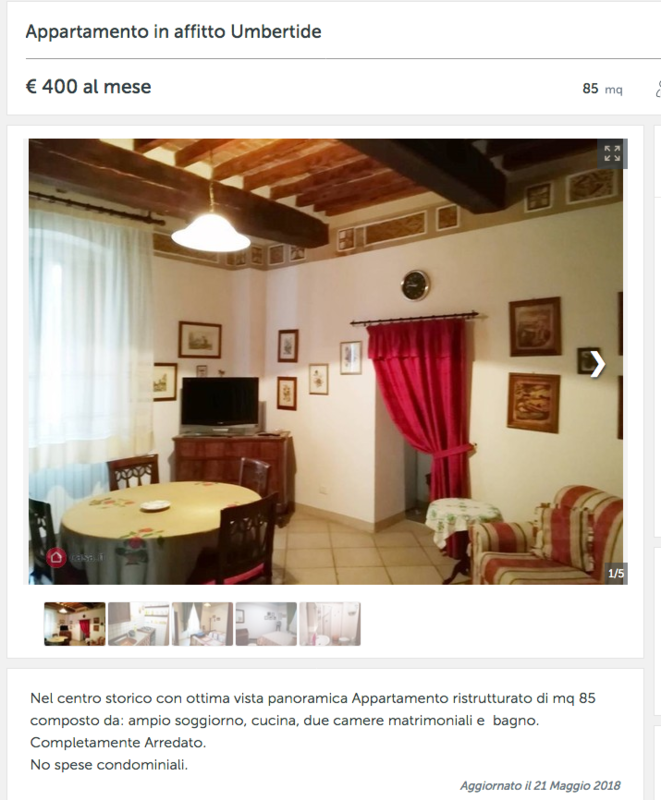 Generally all the northern parts of Italy are more expensive than the south. 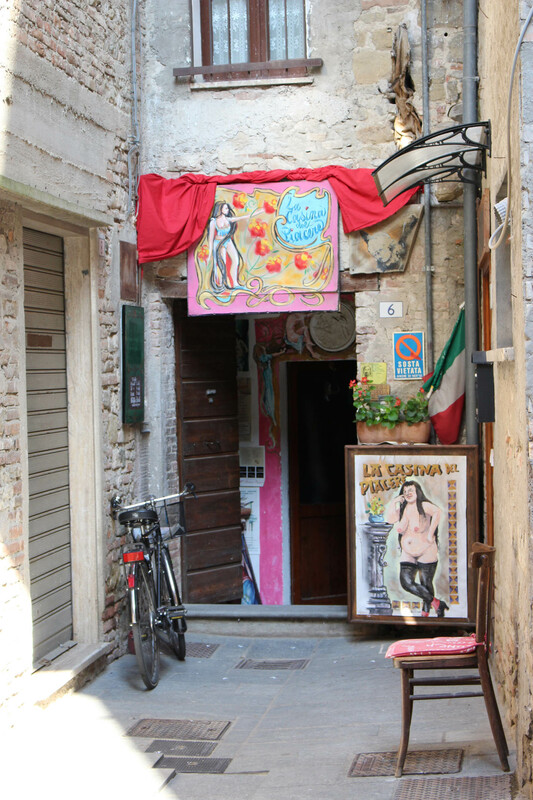 And of course Tuscany, which has always been a magnet for expats is quite pricy, especially Florence. 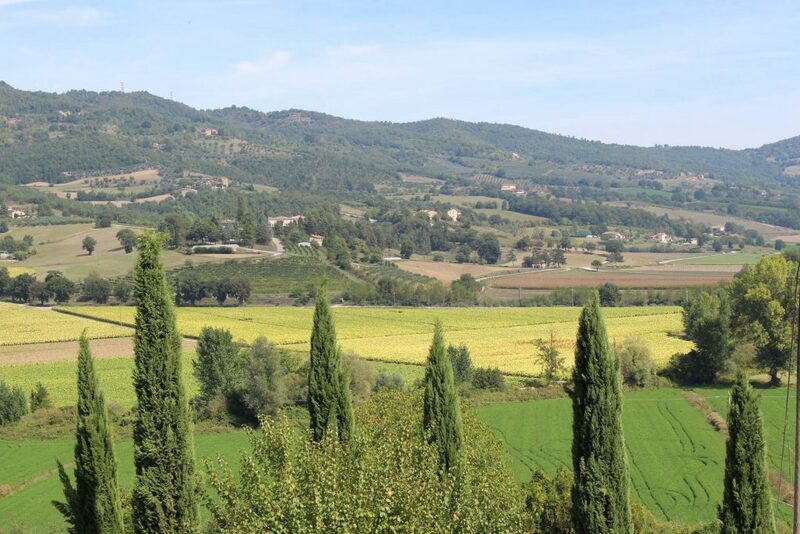 But central provinces like Umbria, or Abruzzo, or les Marche are a real bargain. They also see fewer tourists and, therefore are more welcoming, in my experience. Umbria is just next to Tuscany and has many of the attributes that attract people there. It has beautiful hill towns, the food is amazing and it has some of the best wines in Italy. 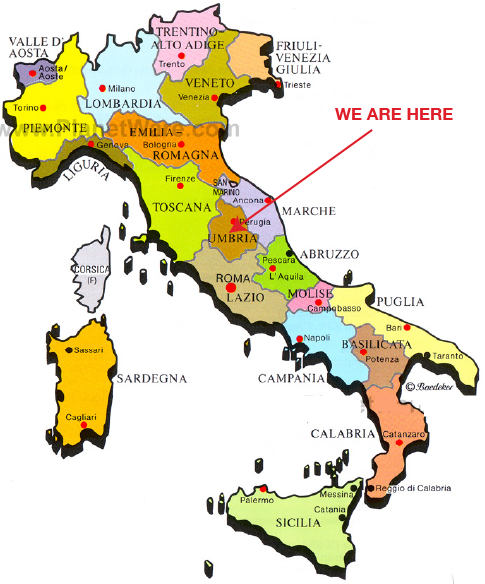 It is also known as the “green heart of Italy” because it is in the center, vaguely heart shaped and, being very agricultural, very green. 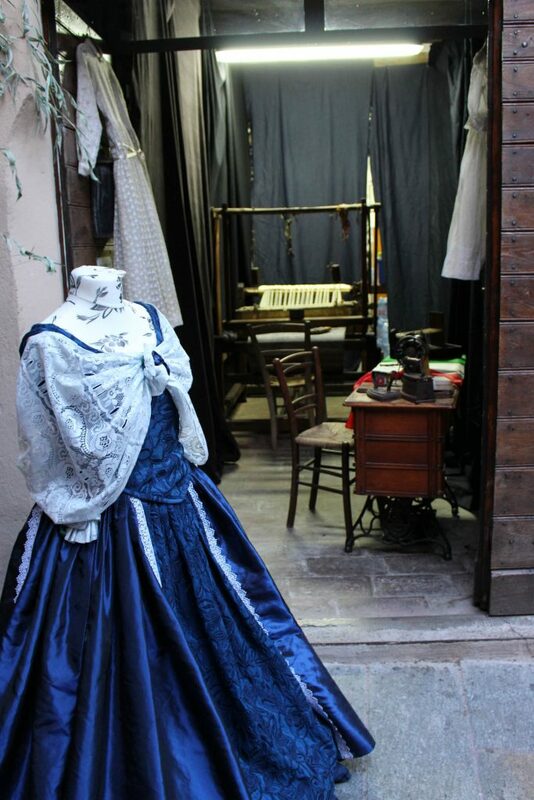 It is also a very traditional area. A little more tranquil and old fashioned. People have asked me how much things cost here so I will endeavor to list some things. Buying a house here is not terribly expensive if you don’t want a palazzo or a fattoria in the country with olive groves etc. But I should also say, like anywhere else, there are a wide variety of houses in a large variety of sizes and price ranges. For lower budgets I know of several habitable apartments in our town in the neighborhood of €80-100K. This would be one or two bedrooms and bath(s). A fixer-upper would be much less. Usually houses here are smaller so plan on 800 – 1,100 sq ft for that price. Also a real savings is that you won’t owe any property tax on your prima casa, or main residence. Apartments for rent are very reasonable. An apartment of this size will rent for in the neighborhood of €400-500 a month. Usually it comes furnished. Generally apartments rent with a lease for 4 years with option to extend for 4 years at the same rent. Other option is 3 years with 2 year extension. But you can negotiate. Many times utilities are included in the rent. Speaking of which, utilities can be expensive here. Houses are rated from A-G for energy efficiency, “A” being the best as far as efficiency goes. Old buildings are notoriously bad with no insulation and thick stone walls which conduct the heat/cold. Our building is about 500 years old and of the later sort. In winter our bills were running in the neighborhood of 240€ for two months. But this past winter we got a 400€ bill (2 months). It was very cold. 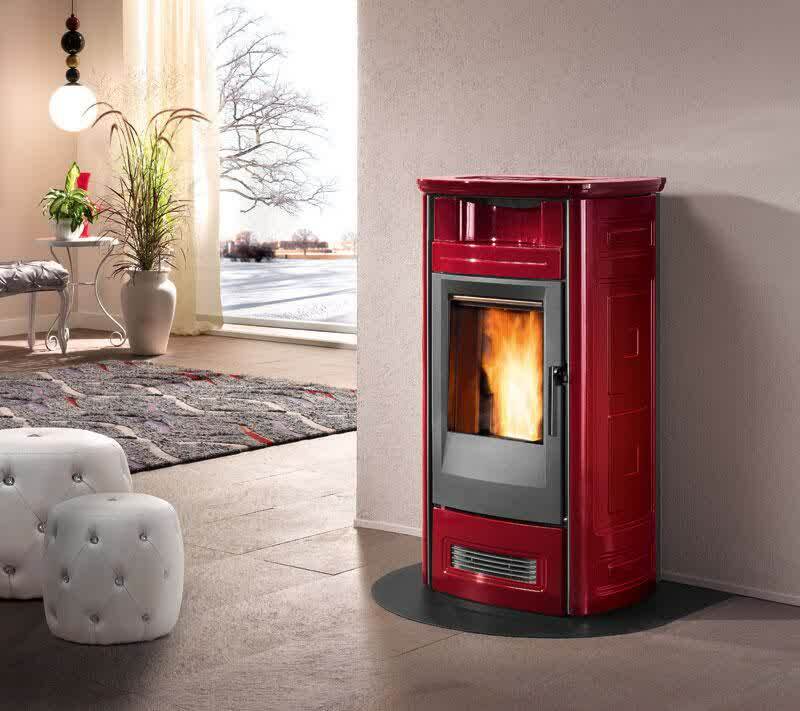 Also most people, including us, use a pellet stove (stufa) to warm parts of the house. Most places do not have air conditioning. We have two electric units. We don’t use them much so our bills are small. Water is a lot less here, around 20€ for 2 months. We pay 75€ for trash removal twice a year. 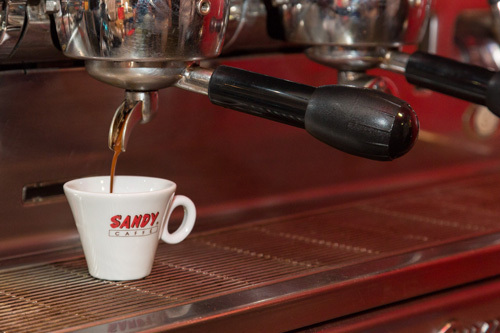 At my local Bar/Coffee shop an espresso is 1€. A cappuccino is 1.20€. Compare that to Starbucks! And it is way better. A small beer is 2€. An aperol spritz (mixed cocktail) is 4€. Many bars have happy hour with snacks gratis if you buy a drink. To buy a basic bottle of wine can cost as low as 3€. 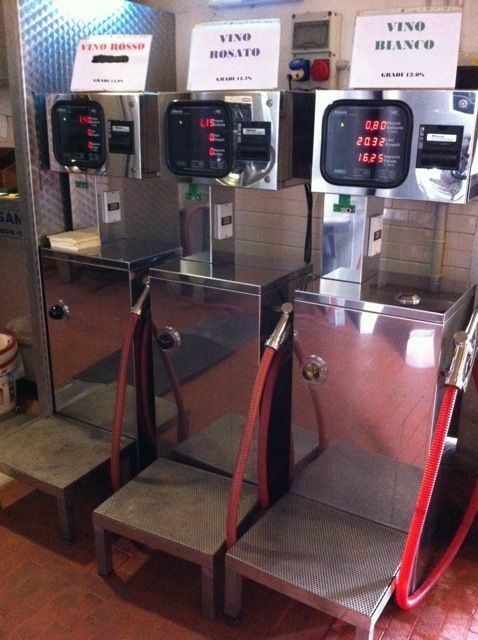 Here they also have sfuzzi which are like a wine gas stations! 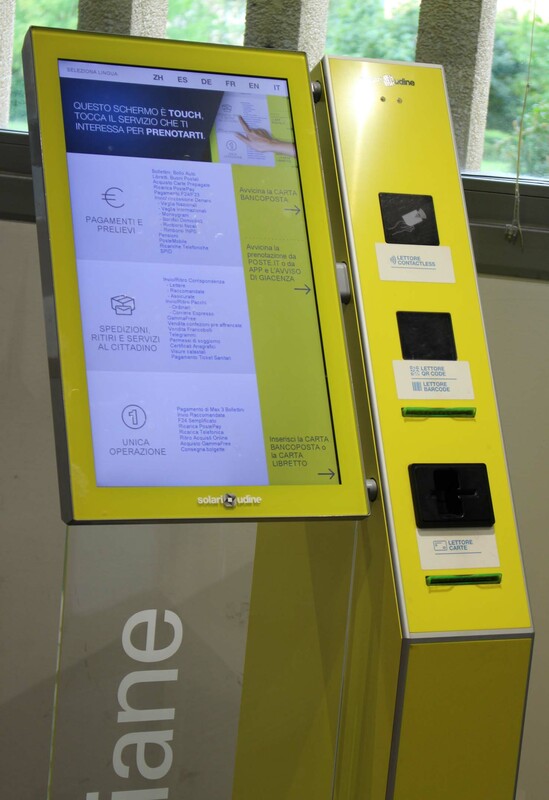 Bring your bottles and fill them for between .80 and 1.30€ a liter! Of course high quality, pedigree wine is more. 12€ or more a bottle. We have several types of restaurants. At a trattoria, which has great local food, you can get 3 courses for around 15€. A fancier Ristorante you will pay more, 5-8€ for an appetizer. 12€ for a steak. Pizza at a pizzeria is around 5-8€ a pie which is more than enough for a person. Contrary to common thought, most places are fine if you ask for a box to take left overs home. You can get just a slice for 1.20€. No tipping here. Round up if you want. This is a comprehensive subject and maybe should be a separate post. Groceries are less expensive on the whole. 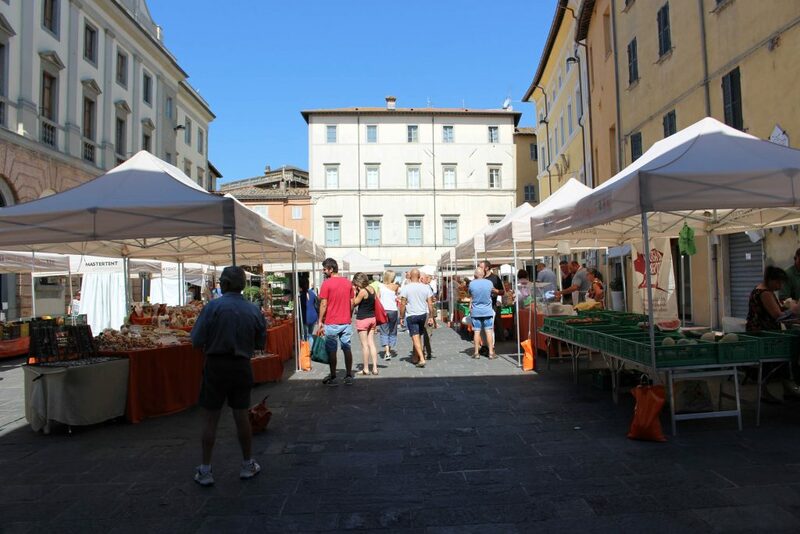 Many larger towns have weekly markets (mercato). The produce is good, fresh and affordable. 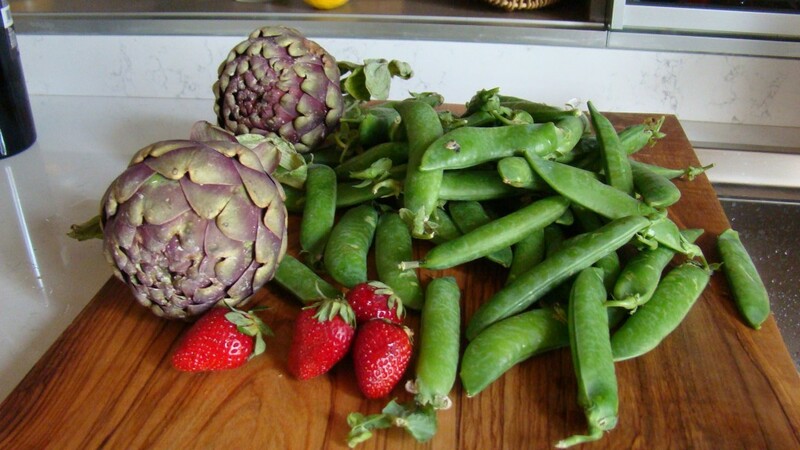 For around 10€ I can get a big shopping bag of gorgeous produce to last a week. 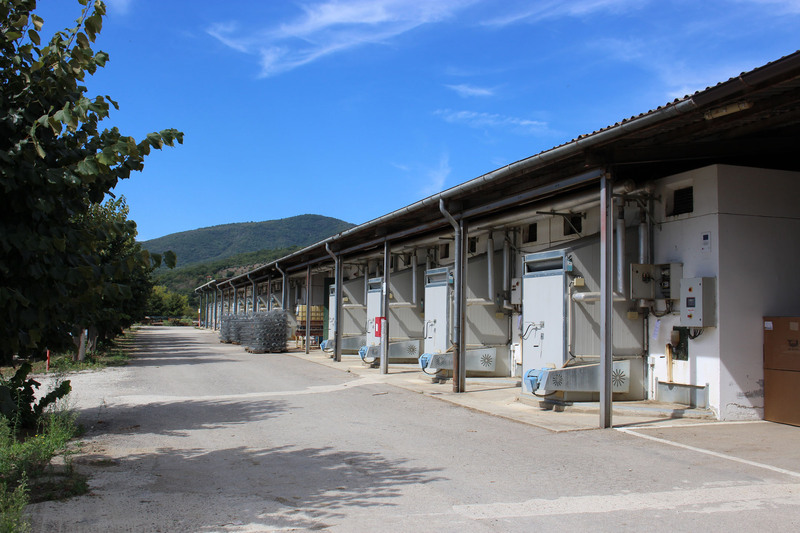 The markets also sell pecorino cheese of all sorts and ages and prosciutto and cured sausages and salami for which Umbria is known. Also a fresh mozzarella man, and my fish lady in her truck. My normal shopping habits are, I shop the two weekly markets, Wednesday and Saturday, for produce, cheese, specialty meats, fish. 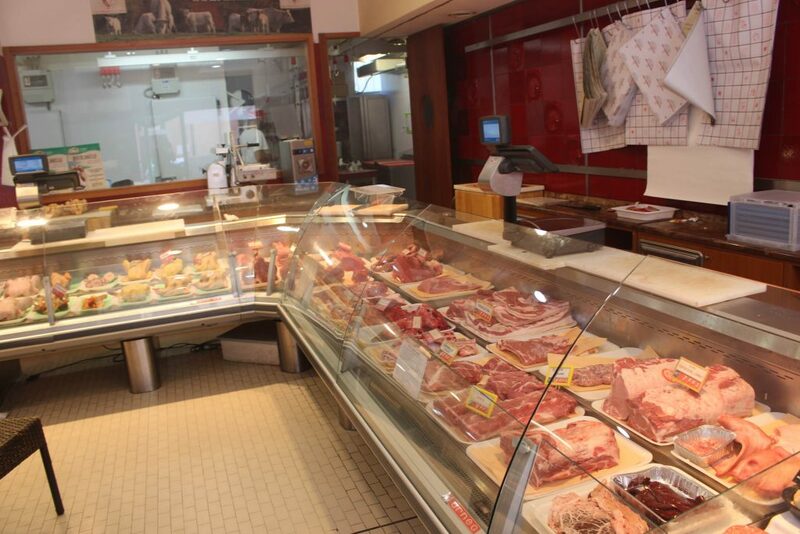 I shop the butchers, bakers, etc for fresh meats and bread. I only go to the supermarkets for staples like sugar, cleaning products, etc. Approximate prices at a supermarket: you can get a whole chicken for 3€. Hamburger patties for 1.50€ each. 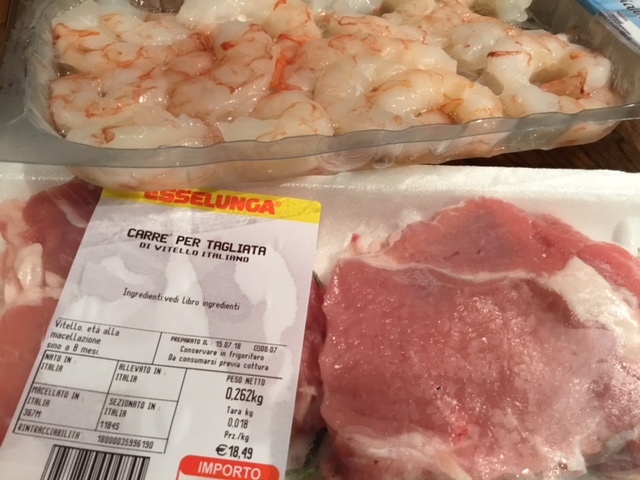 Pork chops for 3€ lb. Steaks for $6 lb. For fancier things you’d pay. Lamb for grilling $3 lb. Autos cost about the same here as the US but you must be a resident to buy one. There is an annual car tax as well. Of course I think everyone knows gas and diesel is a LOT more expensive here. Probably 4-5 times the cost in the US. Our Skye satellite TV costs 30€ a month. Phones you can top up as you use the service. It is a lot less expensive than in the US. 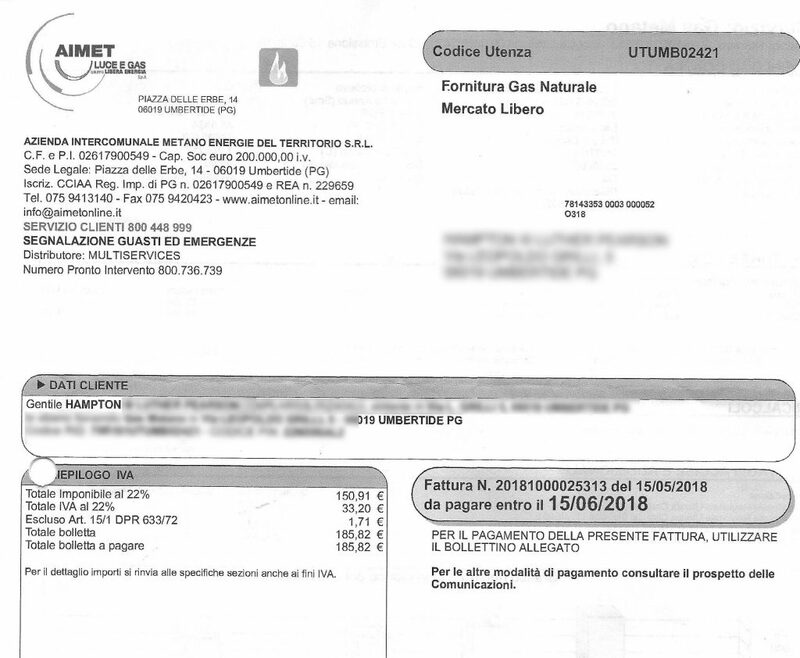 There is a TV tax to pay for public Italian RAI TV rolled into your electric bill. Internet can be rolled into a package with your phone and is not expensive. But it’s not very fast here. Train travel is reasonable. One way to Florence from here is 12€. We take the Frecciabianca from Folognio to Rome fairly often. It’s reasonable (from 16.90€ on the fast Freccia train) and we are in Rome in an hour and 15. Have lunch, shop, come home before dinner. The fast trains (frecce) that run between bigger cities are more expensive and have several classes of seating. Air travel can be very cheap here. There are a number of discount carriers like Ryanair, Easyjet and Wiz air. Umbria has a small airport but it is limited. 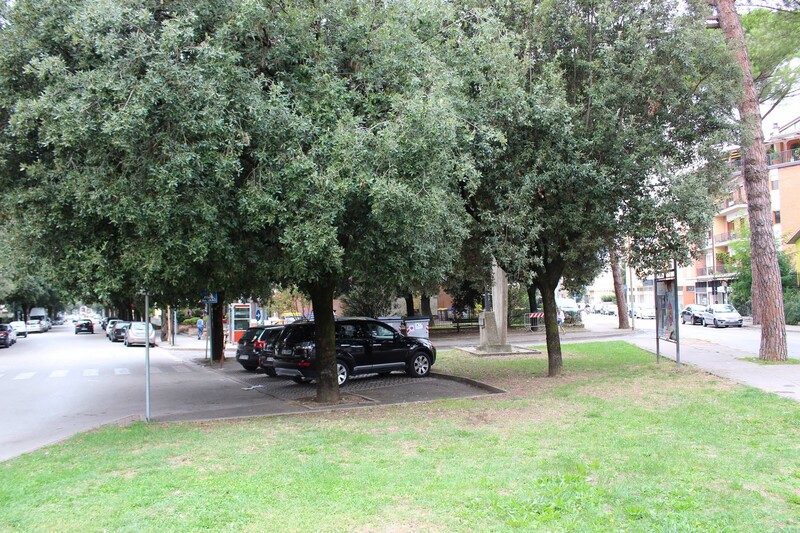 We love it because it is so small and easy to use, parking is plentiful and cheap. We use Ryanair out of Perugia for our annual trip to the UK. There are several flights a week. We also flew to Bucharest Romania on Wizair once, just because we could! And there are a couple of weekly flights to Sicily. In summer they add more. Frankfurt, Brussels, Sardinia, Bari. If you shop around and are flexible you can fly for as little as 19€ round trip to Catania or Bari. Our friends go just because it is so cheap. But for destinations farther afield we go to Rome, Florence or Bologna. 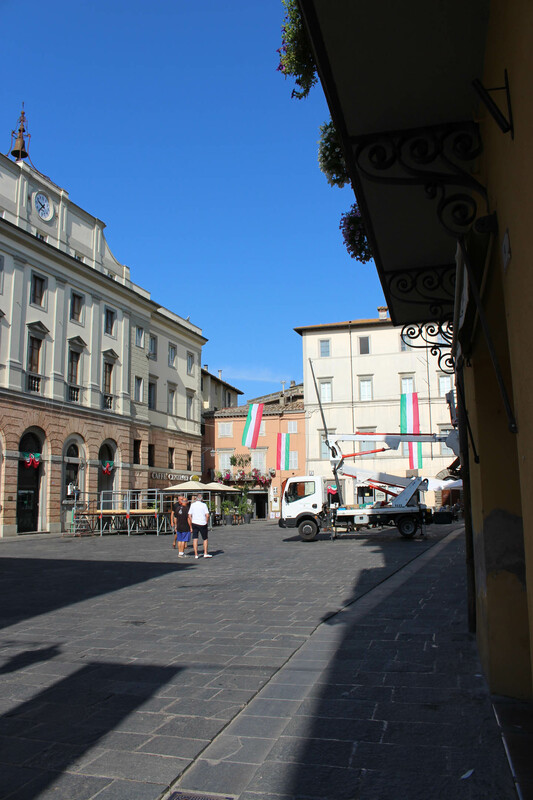 This entry was posted in Eating, everyday life in Umbria, House Hunting, Italian life, Real Estate, restaurants, shopping, Umbertide, Umbria on July 16, 2018 by Nancy Hampton. I asked Luther to go to the butcher and get some things that appealed to him. He came back with a package of the biggest chicken breasts I’ve ever seen! I had to check to be sure they weren’t turkey. But they weren’t. There were eight pairs! So I guess I’ve got to get out my recipes to see how to use them! 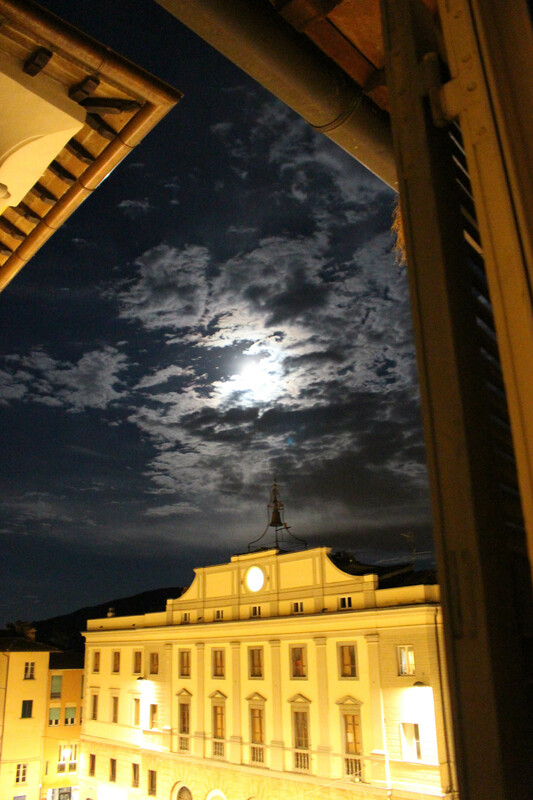 One night I woke and looked out to see a beautiful full moon a’rising over Umbertide. So I snapped a picture. 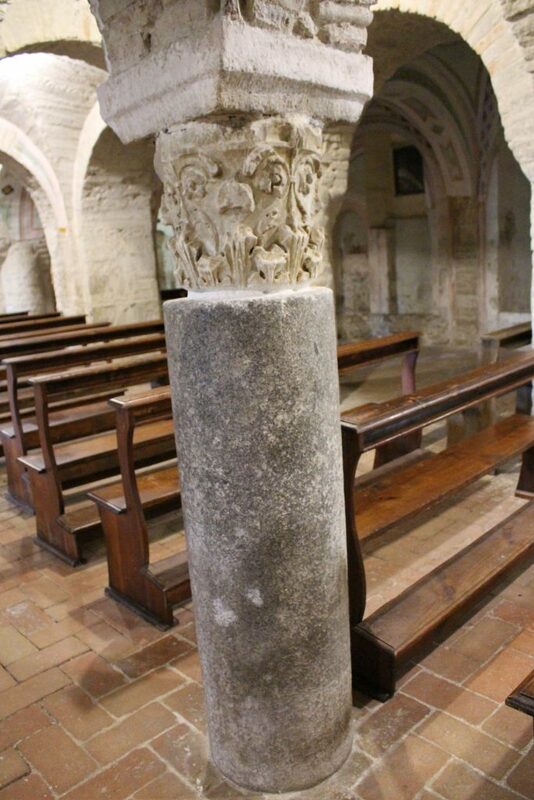 This entry was posted in everyday life in Umbria, Umbertide, Umbria on July 7, 2018 by Nancy Hampton. Spring is fully in progress. 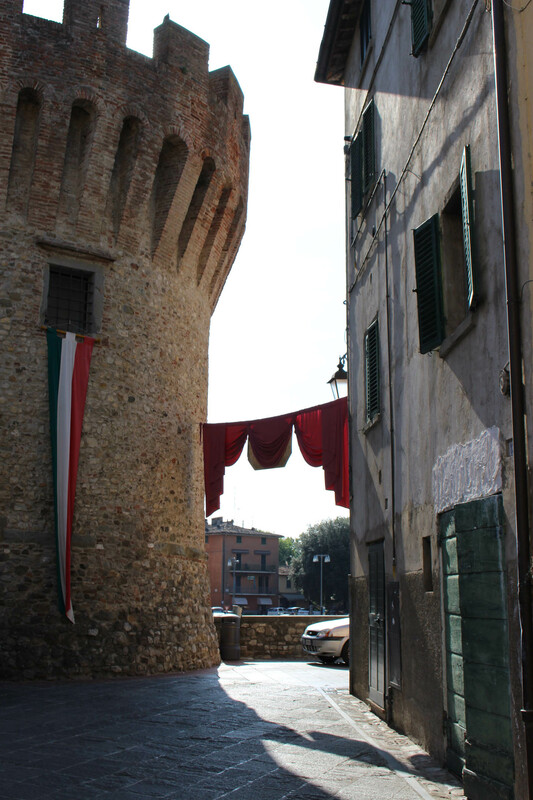 Today is April 25, Liberation day for Italy and the end of WWII so a national holiday. In Umbertide it is a more somber day. 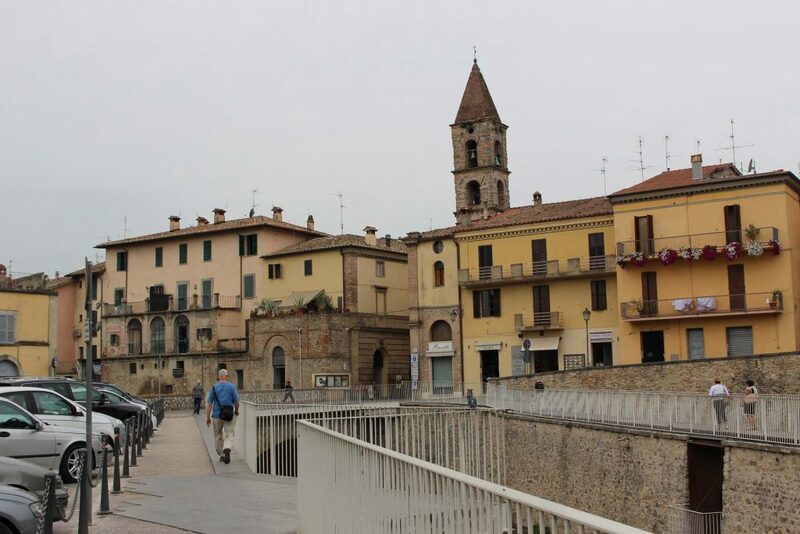 On this day in 1944 the allies bombed the town killing 78 people and destroying about a quarter of the Centro Storico of the town. They were trying to hit the bridge over the Tiber and the railroad to block the retreat of the Germans. They had to try four times before they hit the bridge, meanwhile doing a lot of damage. The sad part is that Perugia knew they were coming an didn’t warn the citizens, who were mostly still asleep in their homes. Had they been warned they may have evacuated. A sad tale. 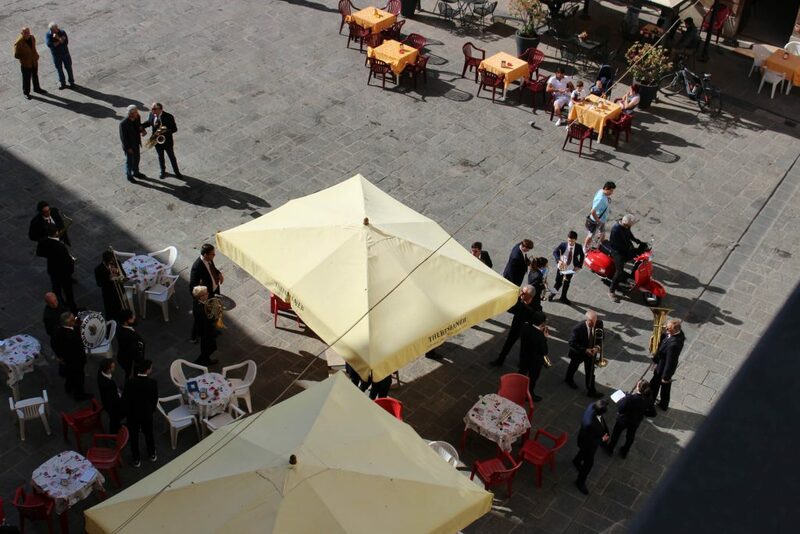 Anyway, they have a Catholic ceremony in Piazza 25 Aprile and the band plays and everyone comes out early in the morning to remember when it happened. As I was watching from my window the Carabiniere showed up in their shiny black and red car. They are the State Military police whose spiffy uniforms were originally designed by Armani. Anyway, they climbed out of the car and started toward Bar Mary for a caffe but as they walked a woman called out to them and one broke off and went over to her, giving her the double kiss of greeting. I couldn’t help comparing them to our police in the US. Hmmm. Yesterday my friend Jen and I went for a little drive around the neighborhood. 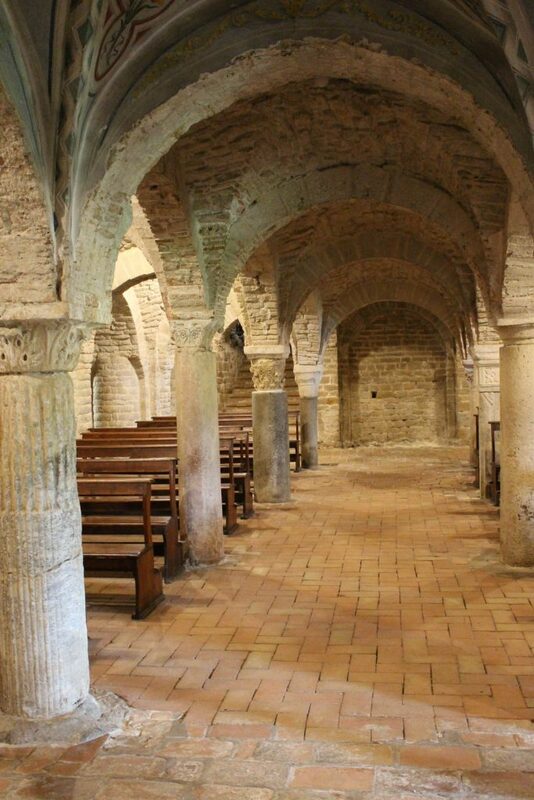 I took her to one of my favorite places nearby, the Abbey of San Salvatore in Montecorona. 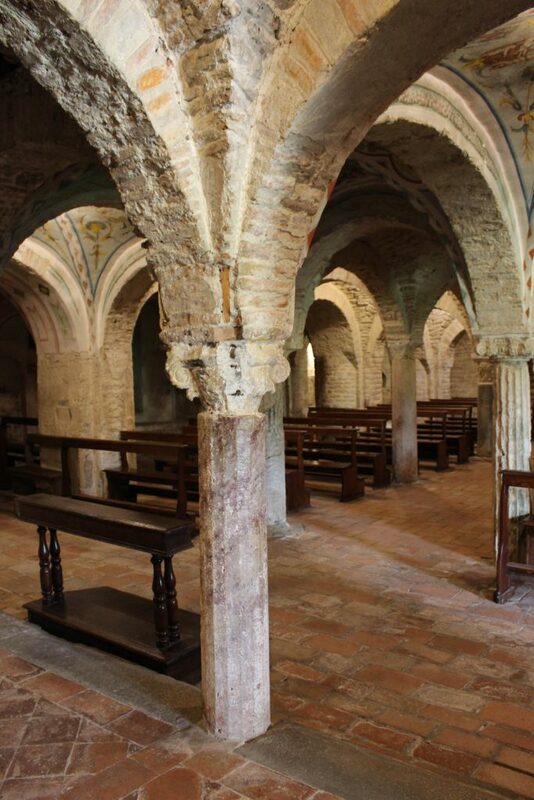 The Romanesque church was built with three naves and an octagonal bell tower and was consecrated in 1105. My favorite part of the church is the crypt. It feels very ancient and special. 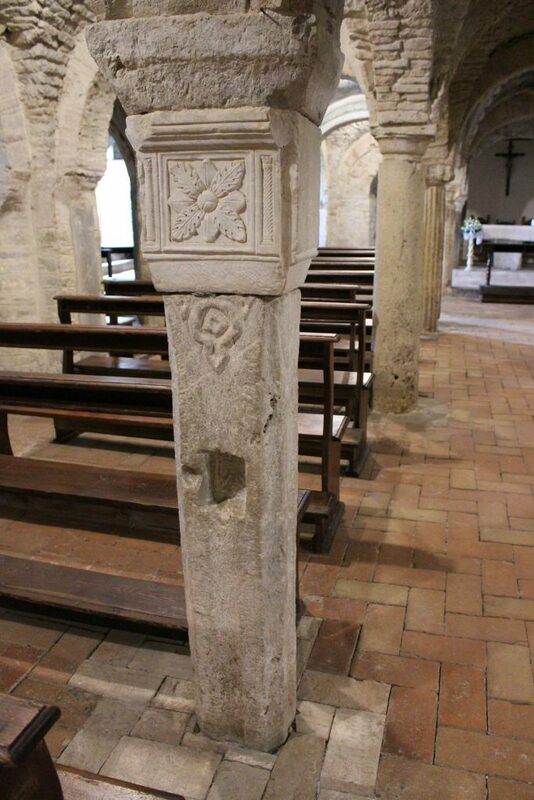 The crypt has five-naves and three apses dominated by roman and old medieval columns, each one different from the other. Check out my pictures. Row of columns. Note the differences. I loved this face. Is it a beast? A bull? 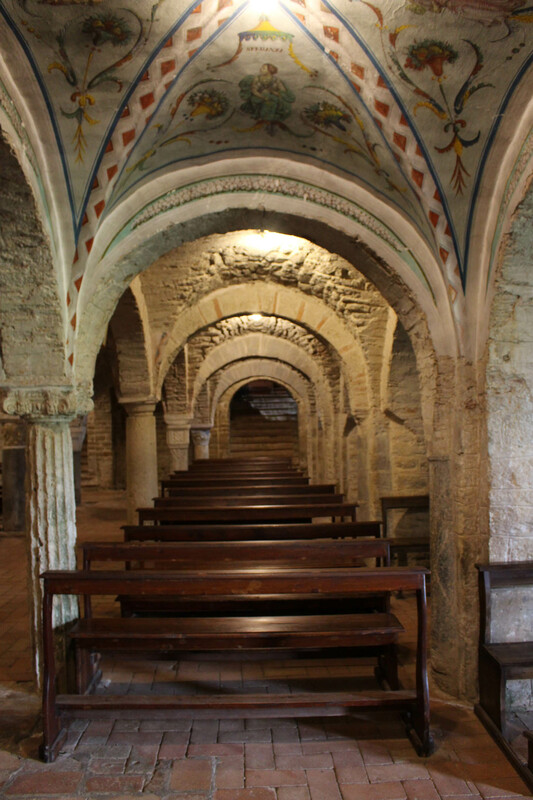 In the very front are a row of frescoes. The rest of the crypt is just stone. Montecorona is also known for its famous peaches. These trees are just down the road from the church. 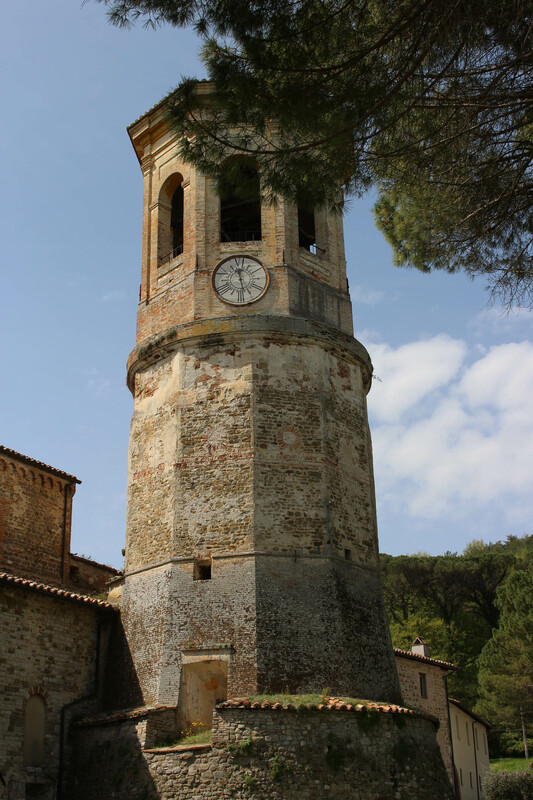 The church is situated at the foot of Montecorona, a small mountain. On its top is part of the abbey associated with the church. 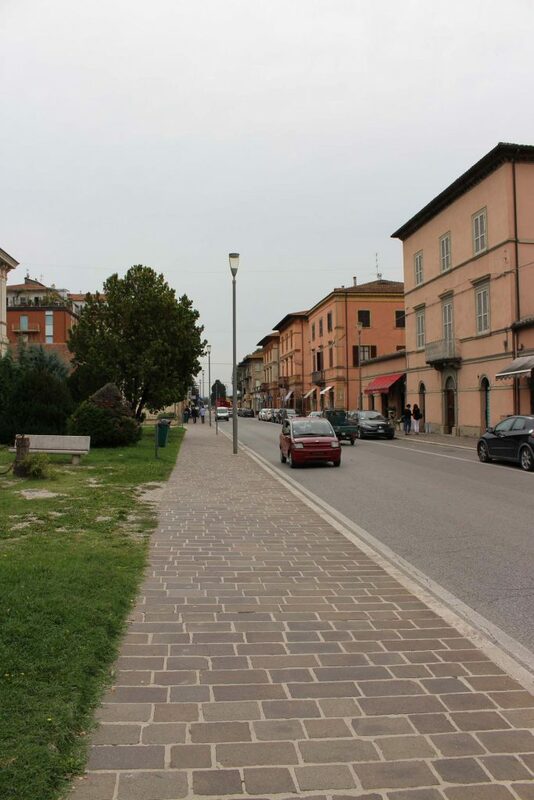 The road itself is the old Roman road that followed the Tiber river valley south. It is very narrow. Barely room for two cars to pass in places. On Saturday Luther and I made a nice excursion to Deruta, the famous ceramics town. I have slowly been gathering a six place setting of ceramics. I ordered another set and some salt and pepper shakers. 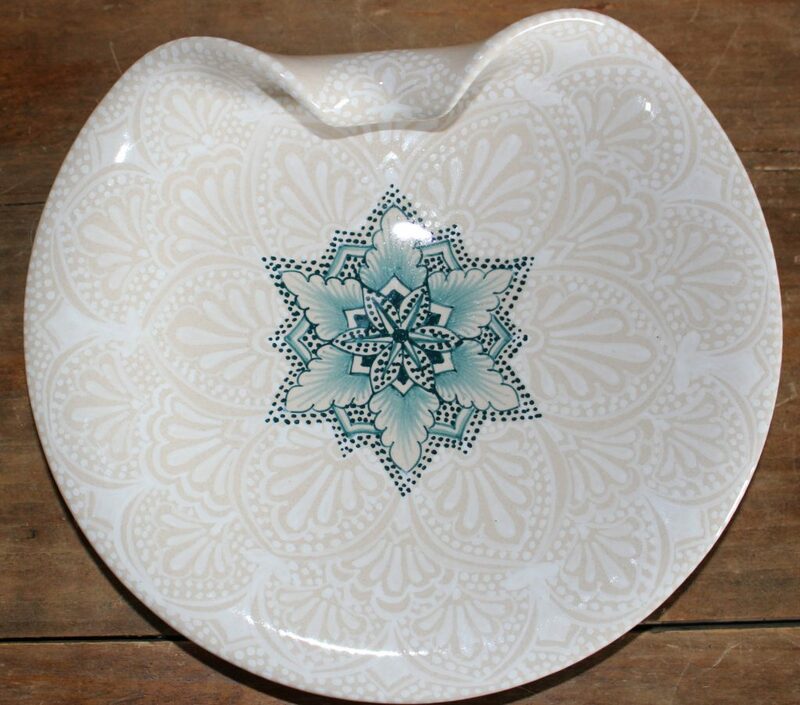 And I bought this pretty little serving plate. 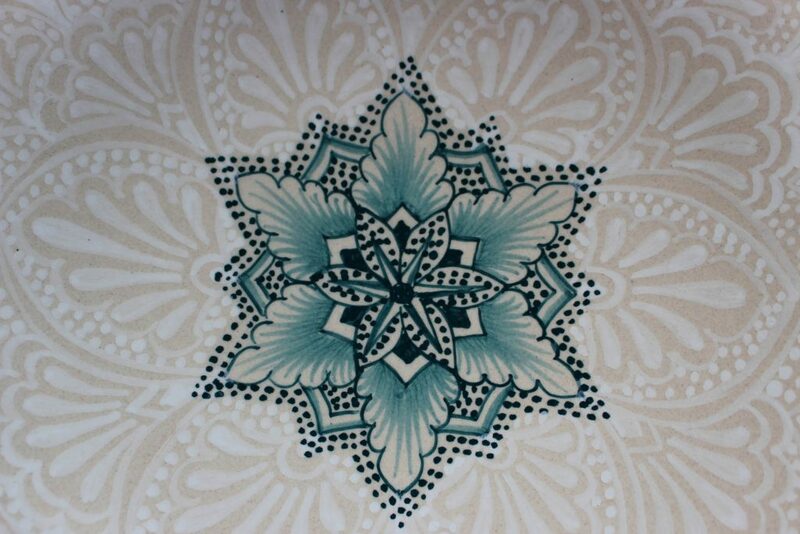 It is the pattern that I chose but each place setting is a different color. This time it’s teal. Last time it was navy, and the time before it was a wine red color. See the detail on the serving plate I bought. Every intricate pattern and dot is hand painted. Hence the cost! And a mundane issue. My Lavatrice — washer — died last week. So we walked over to our local Formica store. Formica means ant in Italian. No idea why a chain of stores would be called that! Anyway, they had a good selection and we chose a new washer and drier which were delivered and installed the next day. We went back and paid for them after I tried them out. They are so much better than the old ones! 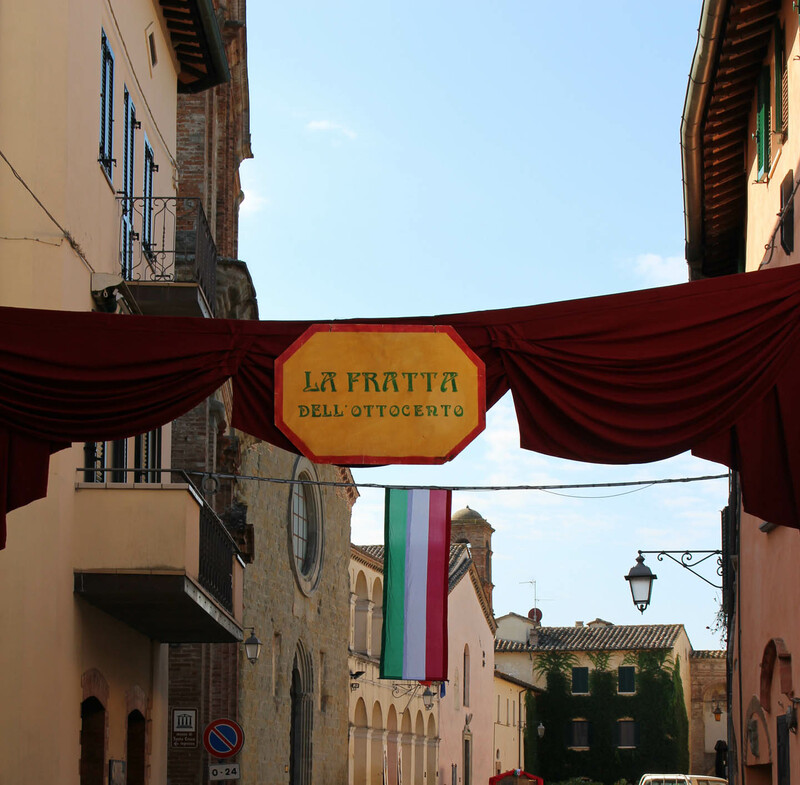 This entry was posted in everyday life in Umbria, Festivals and Sagras, Italian life, Travel, Umbertide, Umbria, Uncategorized on April 25, 2018 by Nancy Hampton. One of my posts prompted a comment about recuperation in the US vs Italy. I opined that in the US everything is go, go, go and get well, and back to work. Here it is piano, piano, take it slow, heal, you’ll be fine in good time. So which is better? Hard to say. I’m following instructions and trying not to feel competitive with those who are moving faster than me…after all, whats my hurry? 🙂 piano, piano. That said I am not really happy with my walking ability. The knee is quite weak with it buckling unexpectedly when I take steps. This makes me less confident in my ability to walk. Other things are going well. The knee bending is very well. Sleeping is easier but I wake a lot when shifting positions and going from bent to straight leg. Next week I plan to go to the local pool with my friend Joanne who will show me the ropes there. Then I can do aqua exercises. I’m told this is an excellent way to work the knee. Other than the knee last week I had a unique experience. I had received a letter in the mail with an appointment for my annual mammogram. 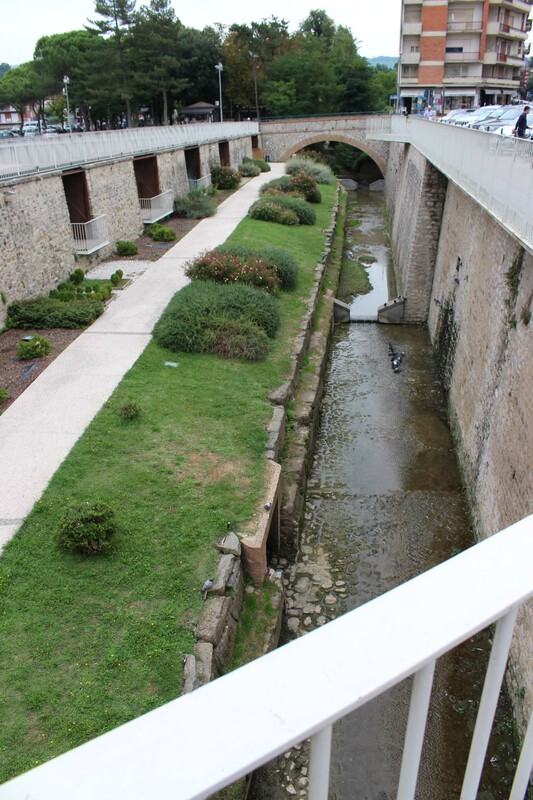 So we headed to Città di Castello to the hospital. I’d been once before so felt fairly confident going again. I sat at the desk where the woman, in pretty violet scrubs, looked up my records online and nodded to a man, wearing brilliant red scrubs, who came and took me to the scanning room. I had a bad feeling about this. His hame was Marco. He asked a couple of questions and indicated I should take my shirt etc off. Well. I had never had a male mammogram techician before but one has to go with the flow as it were so I did. It wasn’t so bad. I just have to wonder why a man would choose this profession. Yes he gets to see and touch lots of breasts but it is hardly titillating. Afterwards we visited one of our butchers. We needed provisions. Then, while Luther parked the car I made a loop through our Kilo zero market. The veggie people have just what is growing nearby. Cabbages…many sorts. Kale. Chard. Spinach. A few root veggies. This is the time of the year when the farmers who lived off of their crops are ready for some spring growth. They have been eating the available greens growing now, supplemented by the preserved bounty from last summer. Nearly gone. The good news is that spring has started to put in a pretty steady appearance. I am starting to look forward to the spring early veggies. I’ve also started to clean up our terrace. 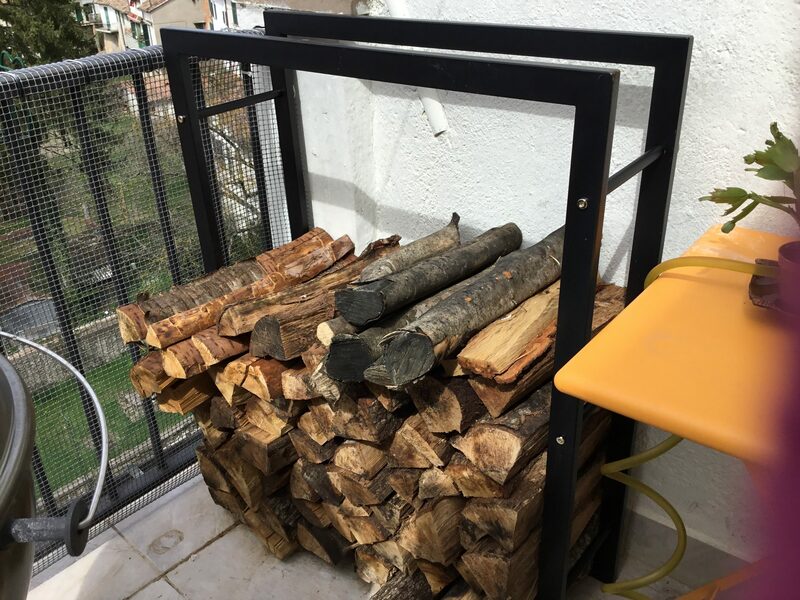 I bought a nice wood rack for the wood we didn’t use. And I’ve been scrubbing the grout and tiles. My pots are being slowly dug up and the old plants relegated to the trash. I will be ready in May when we start to plant again. I am thinking about what to try this year. Always fun to plan! I have lots of pots now since my failed corn adventure last year. 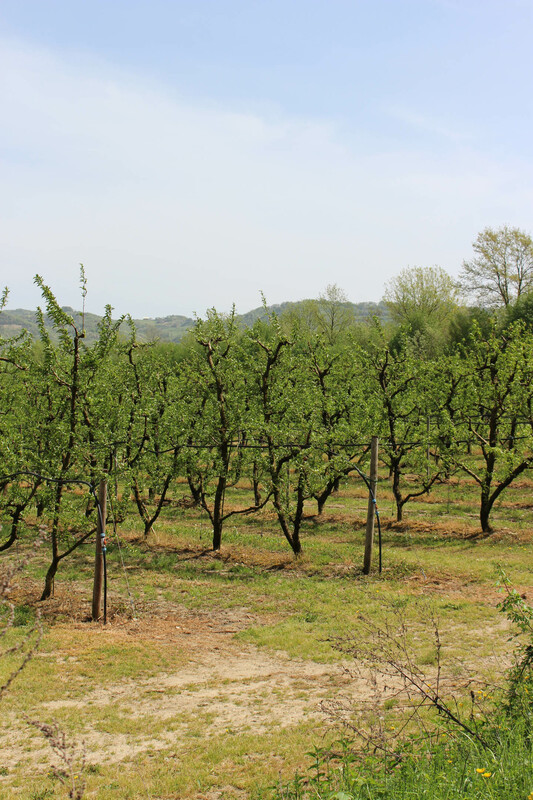 This entry was posted in everyday life in Umbria, garden, Health care, medical, Umbertide, Umbria, Uncategorized on April 3, 2018 by Nancy Hampton.